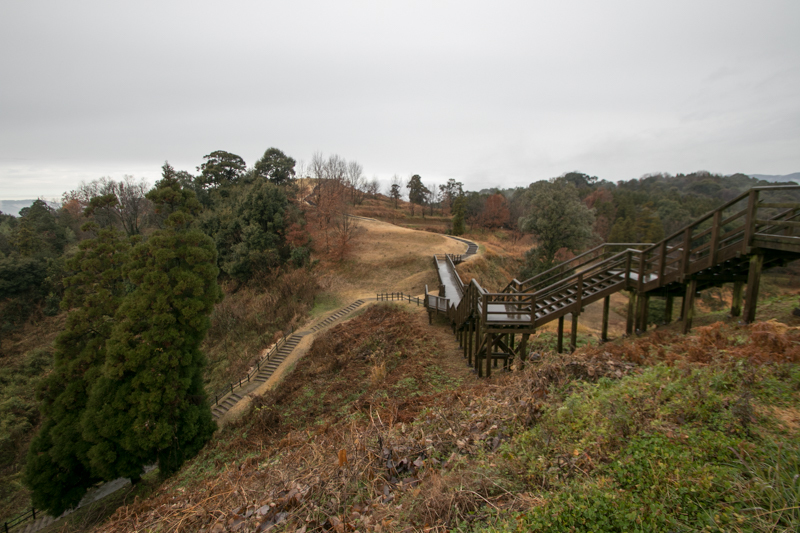 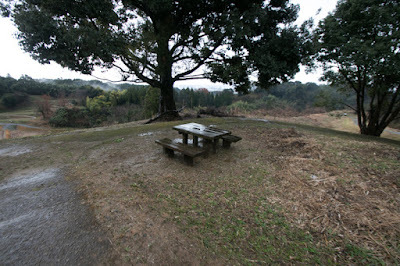 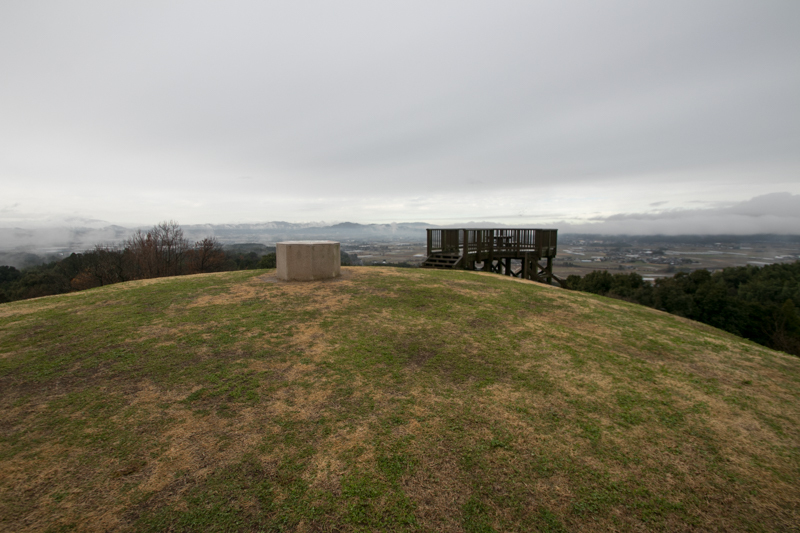 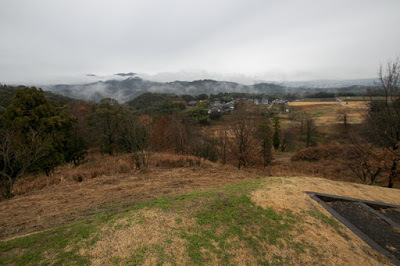 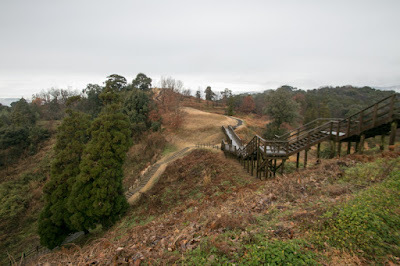 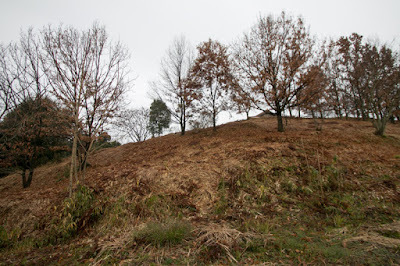 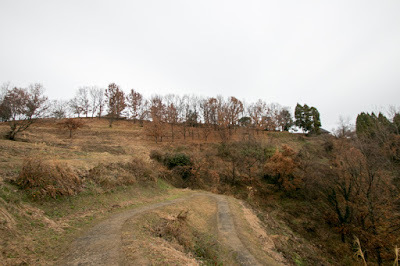 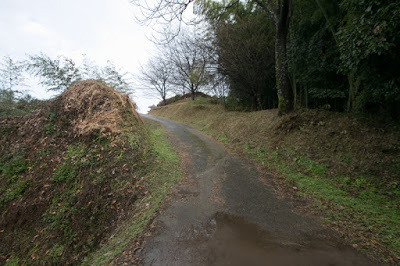 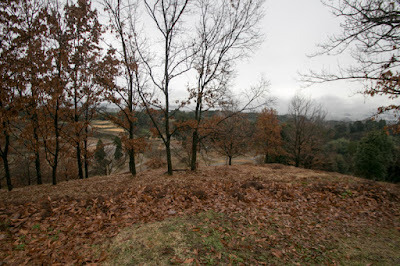 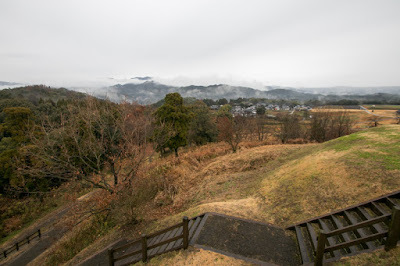 Kikuchi castle (鞠智城, neighbor medieval castle of Kikuchi clan is also called as Kikuchi castle) is built over a table like plateau of about 50 meter height from hillside and surrounding valley spreads from Chikuhi mountains to Kikuka basin. Kikuka basin is a flat crescent like basin at the middle part of Kikuchigawa river at the northwest of Aso mountain. 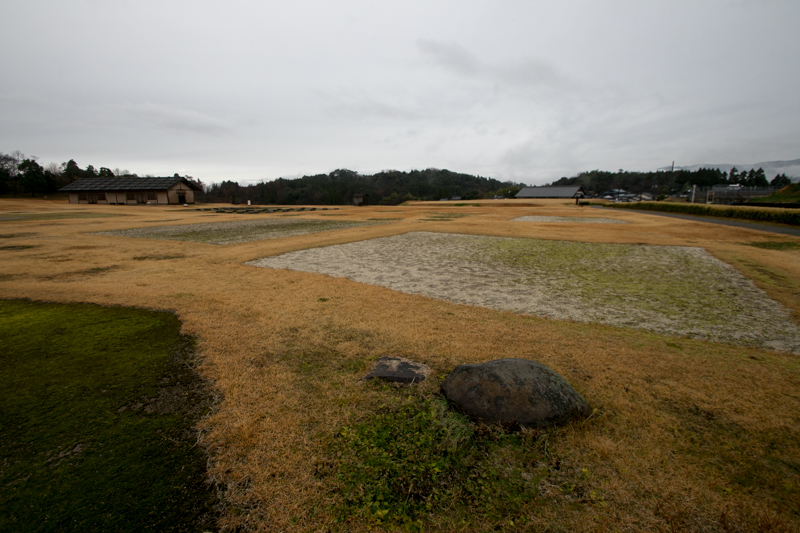 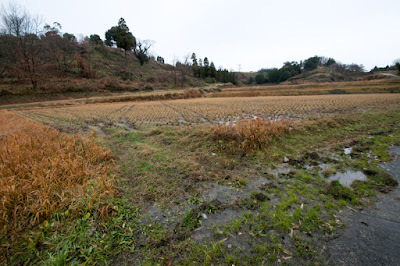 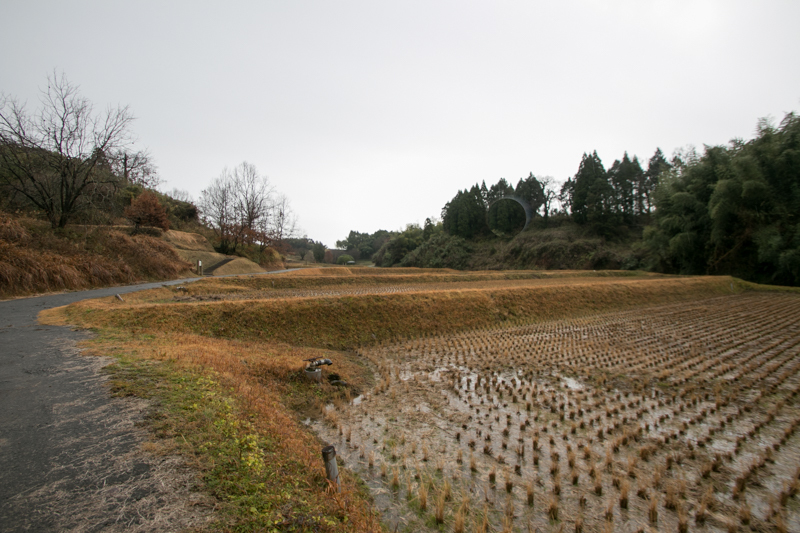 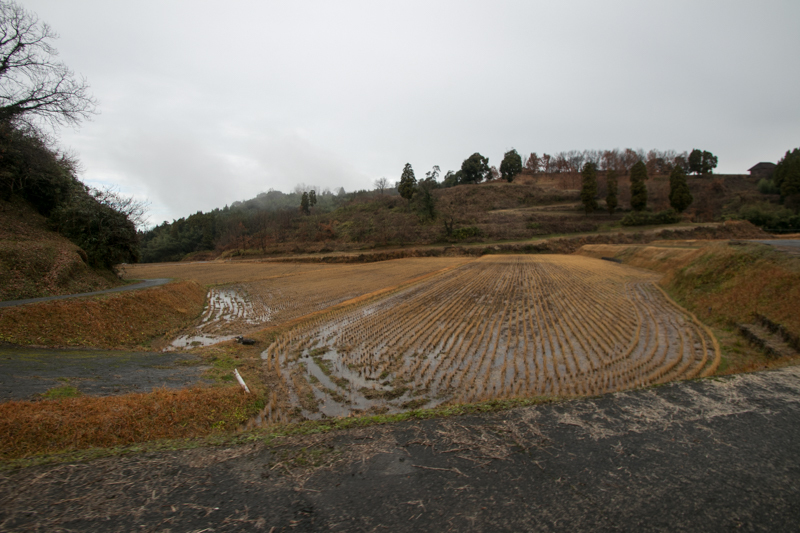 Because of flat terrain and good water, this basin is a popular rice farming area at Kyushu island. 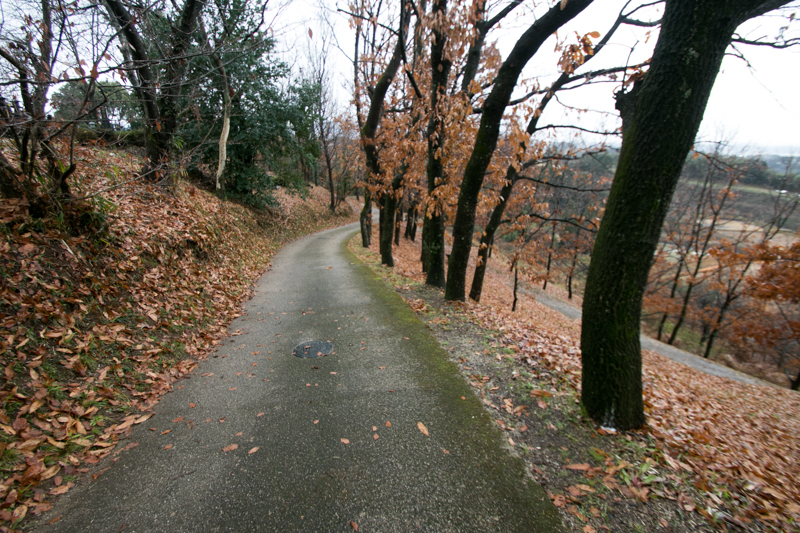 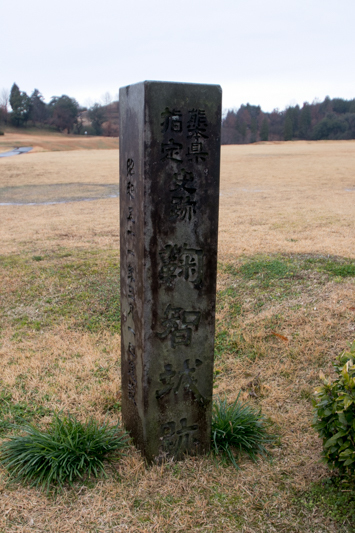 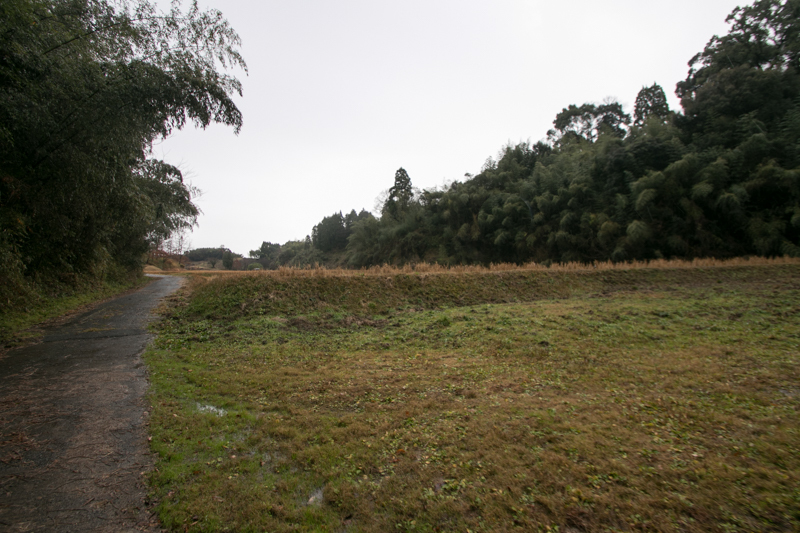 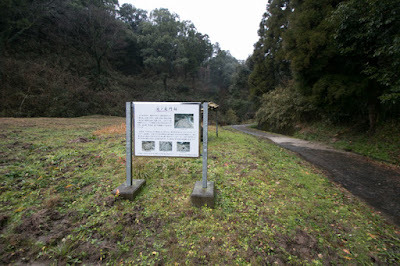 Today Kikuchi area is apart from the main stream of Kyushu island from Fukuoka city to Kumamoto city and Kagoshima city, but in ancient era being favored by its security surrounded by mountains and valleys, river transportation toward Ariake Sea and good cultivation, this area had been an prosperous area with many ancient ruins. 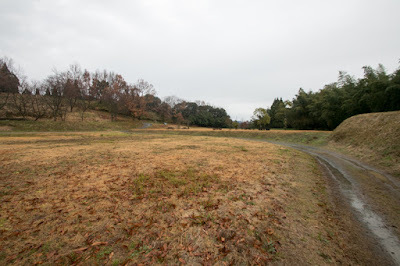 Even in medieval era, South Court army pushed out from Dazaifu city (current Fukuoka city) by Muromachi Shogunate army moved their main base to Kikuchi area and keep resistance with local lord Kikuchi clan against overwhelming Shogunate army over 50 years. Kikuchi castle was built by ancient Yamato dynasty in the latter half of 7th century, probably around 670. 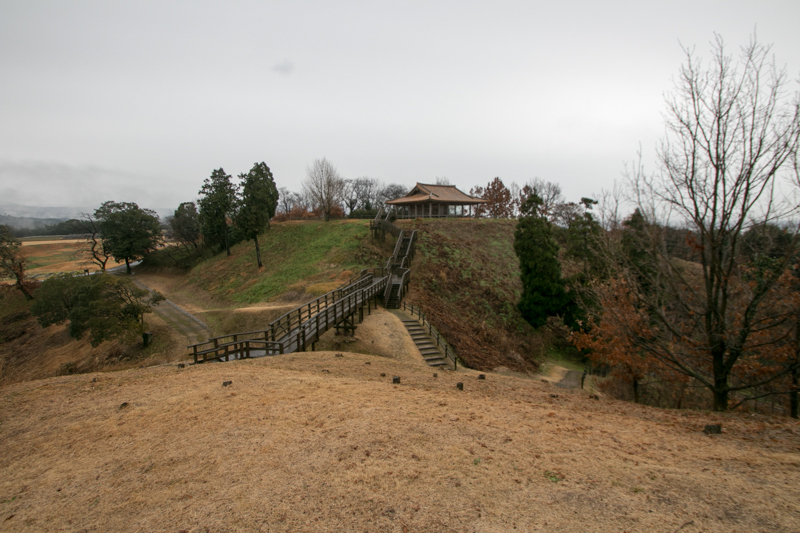 In 663, an alliance army of Yamato dynasty and ruined Korean Beakje kingdom ruined in 660 suffered severe defeat by alliance of Korean Silla kingdom and Chinese Tang dynasty at the battle of Baekgang, which occurred at the mouth of Geum river in southwest part of Korian peninsula. Yamano dynasty lost many soldiers and ships, and had to seriously consider the possibility of attack to Western Japan, especially north part of Kyushu island. 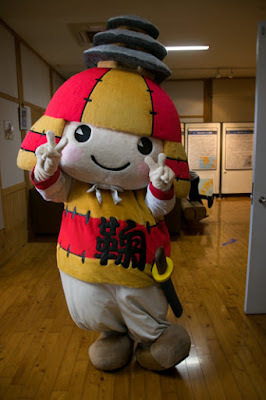 Under such situation, Yamato dynasty had to protect Dazaifu city, the vice capital of Western Japan its local government, and Setonaikai Sea which is directly connected to capital area of Yamato dynasty such as Osaka area or Nara area. 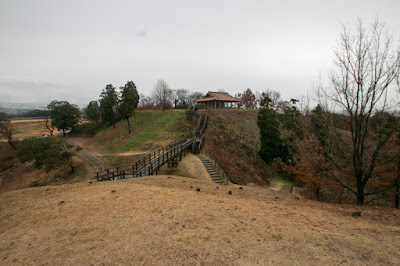 Opportunely Baekgang kingdom was extinguished and many refugees including castle engineers came to Japan, Yamato dynasty build many Chosun style mountains castles such as Kii castle (Fukuoka prefecture), Kinojo castle (Okayama prefecture), Yashima castle (Kagawa prefecture) and Takayasuyama castle (Osaka prefecture) around north part of Kyushu island and coast of Setonaikai sea, expected invasion rate by foreign country to the capital using coast fleet. 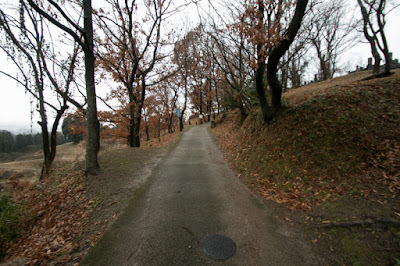 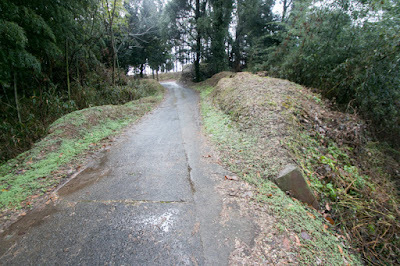 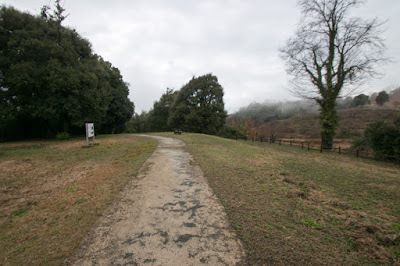 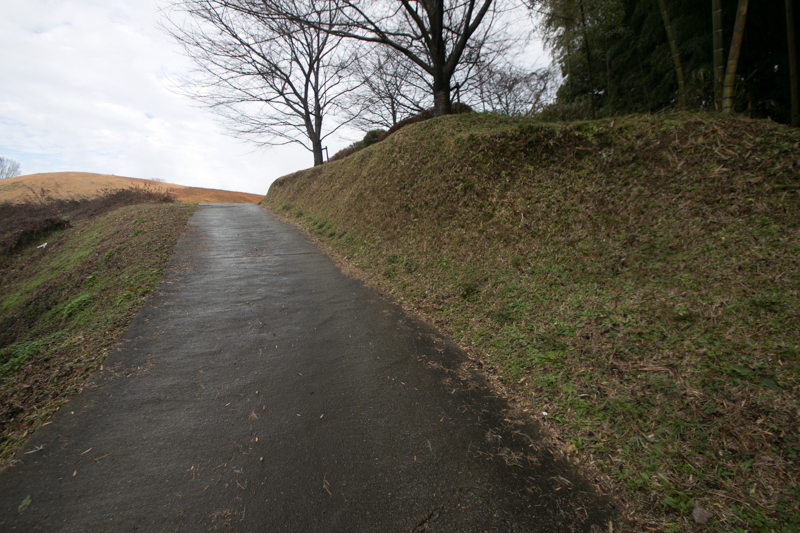 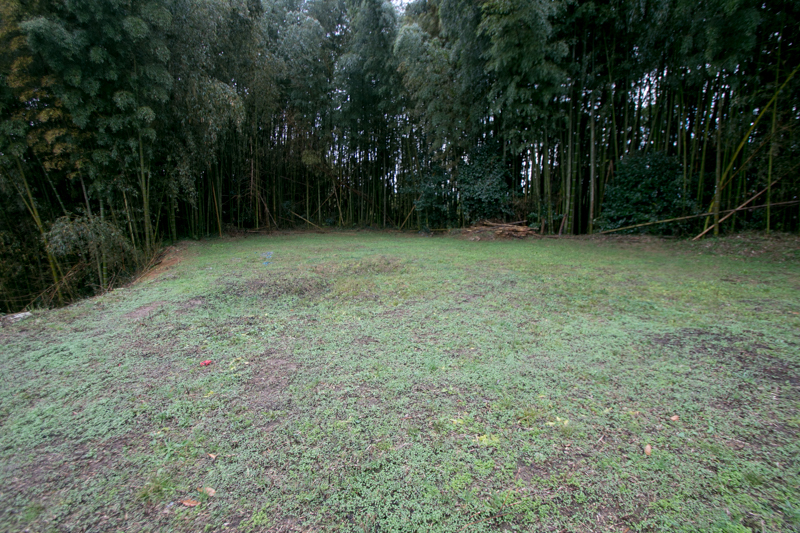 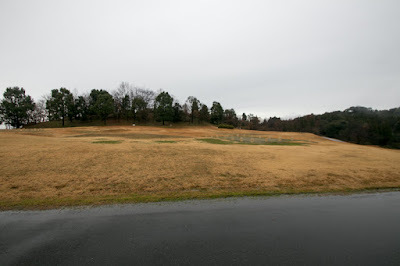 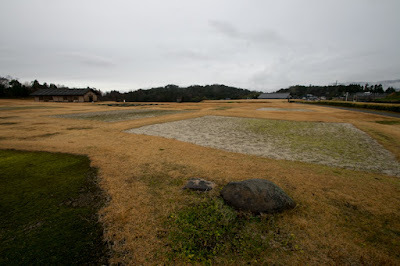 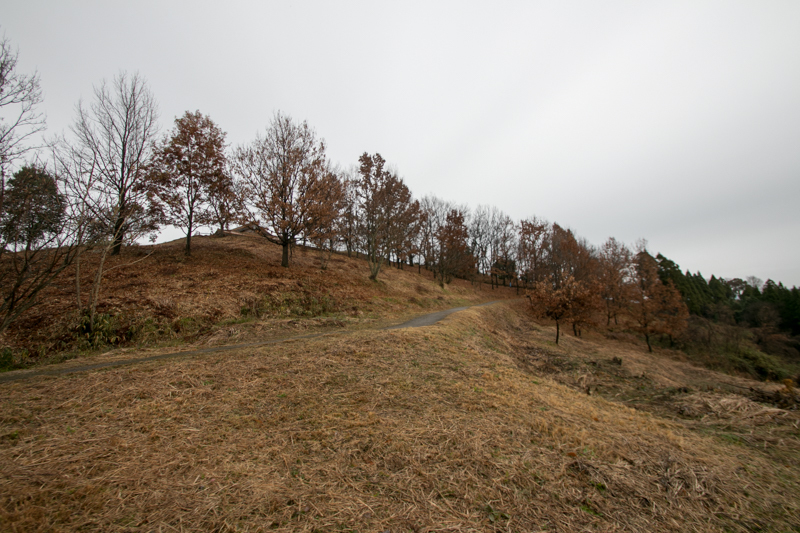 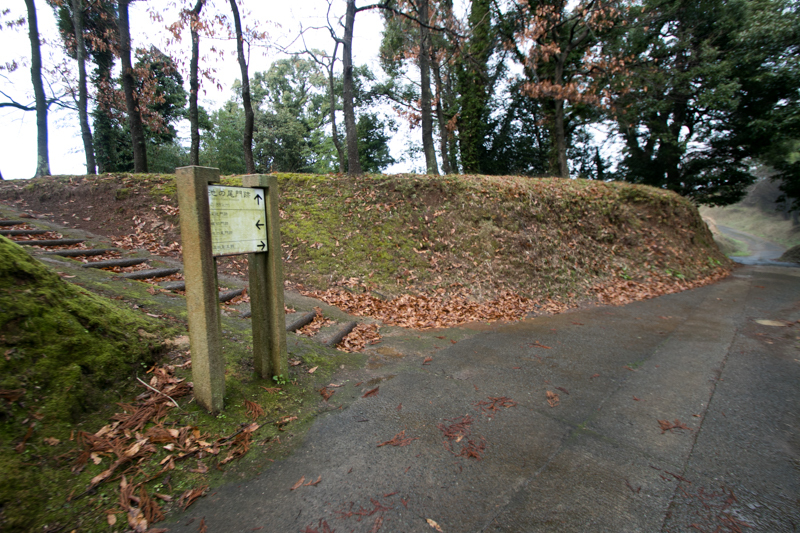 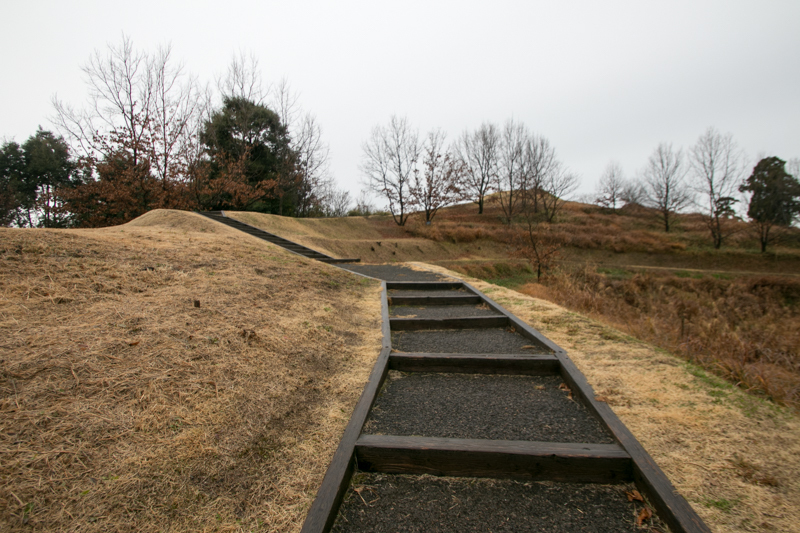 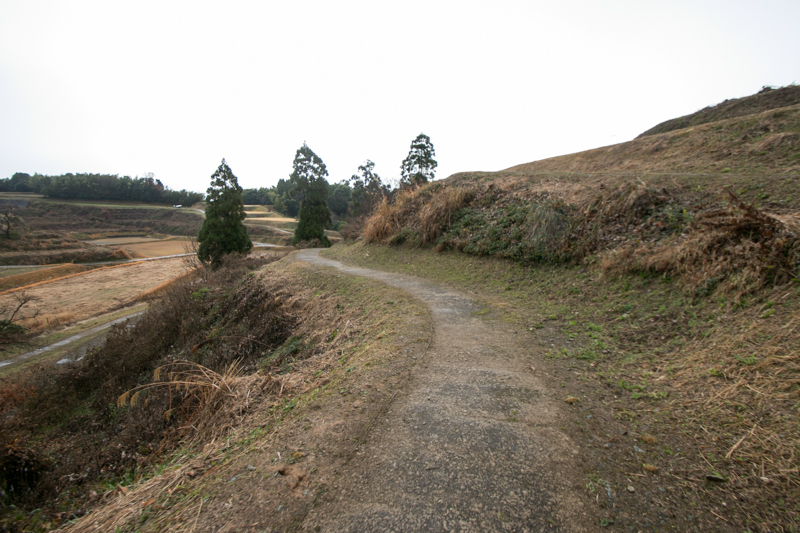 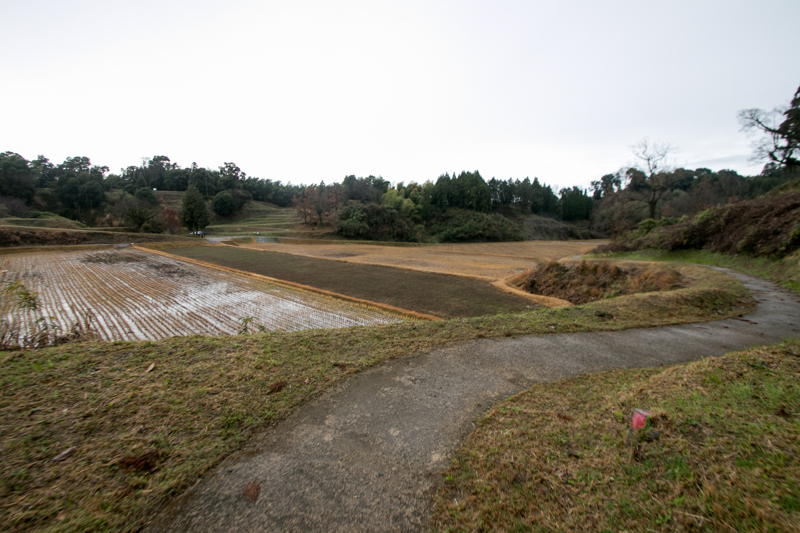 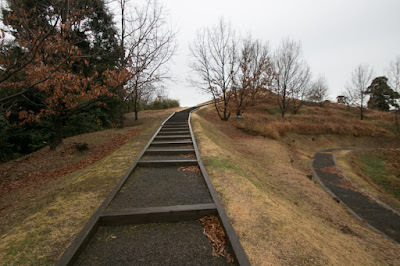 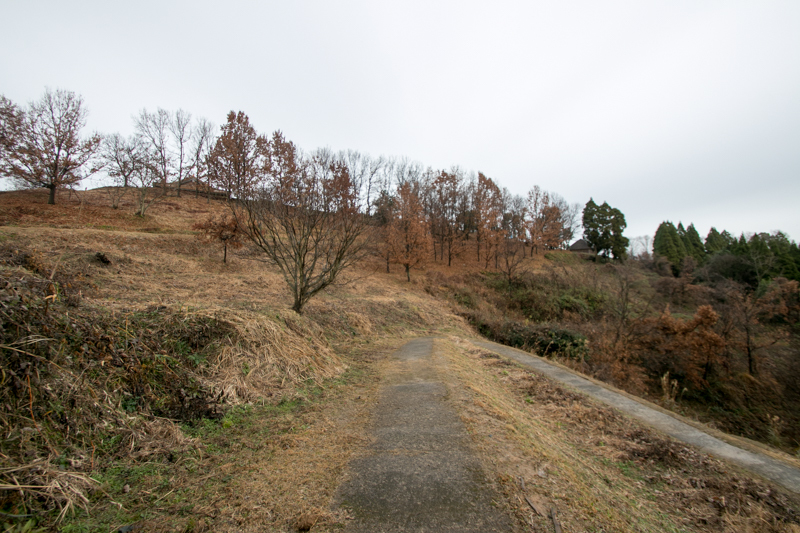 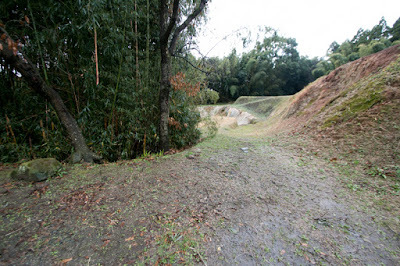 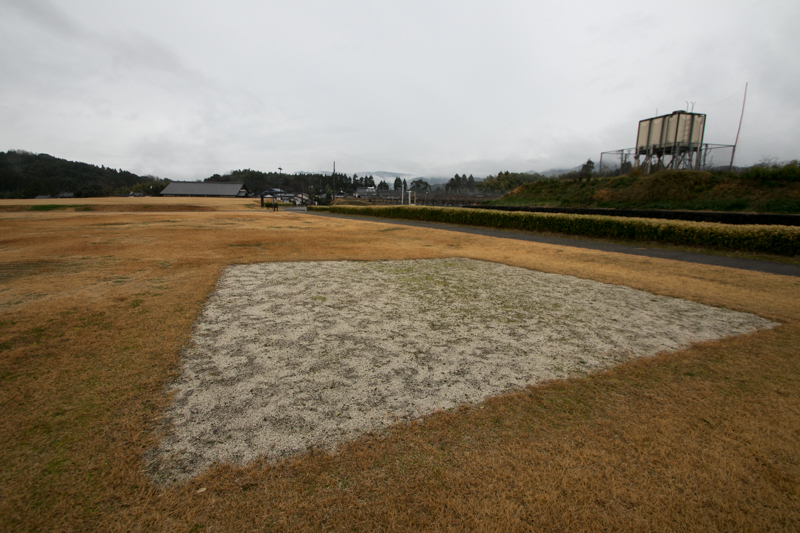 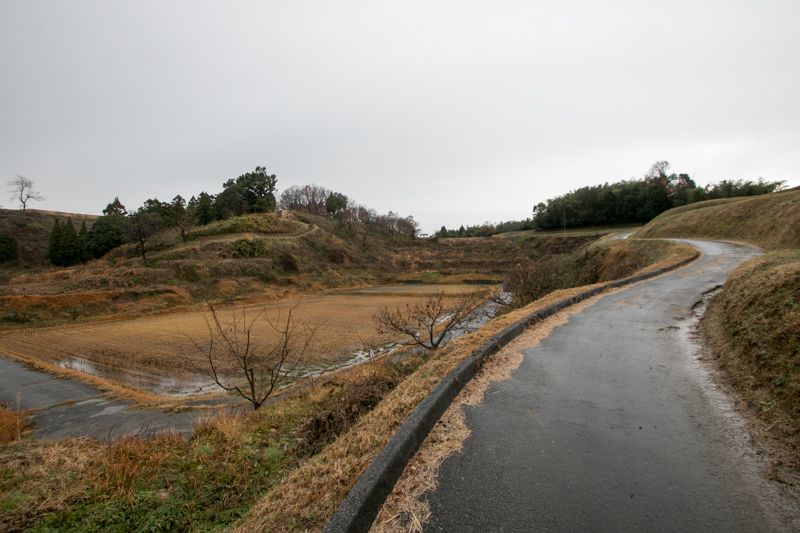 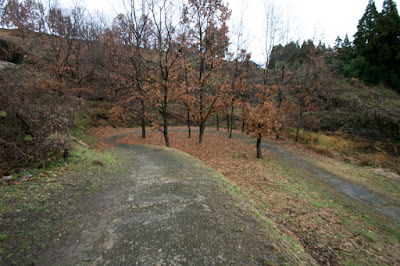 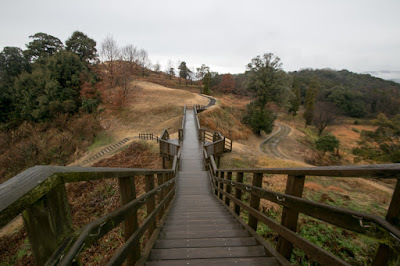 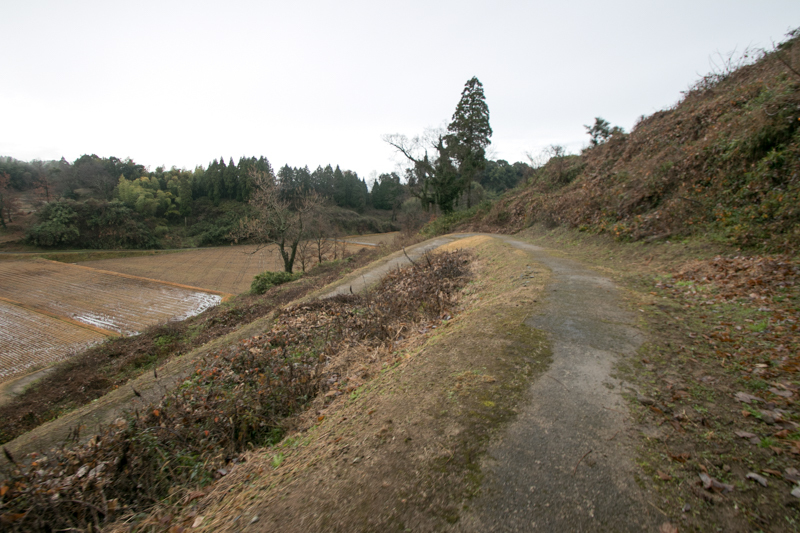 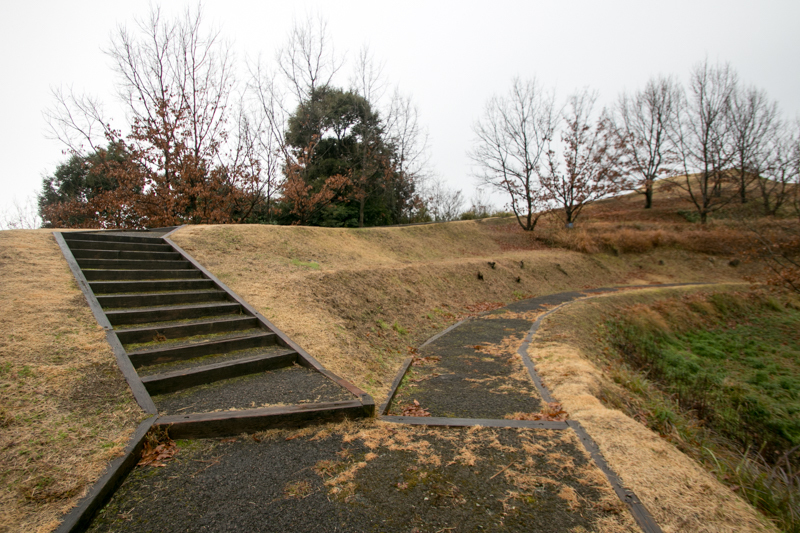 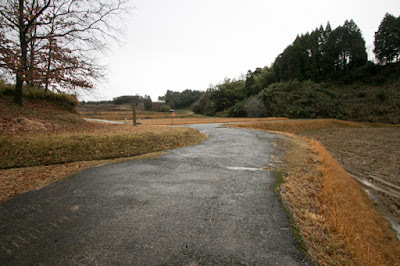 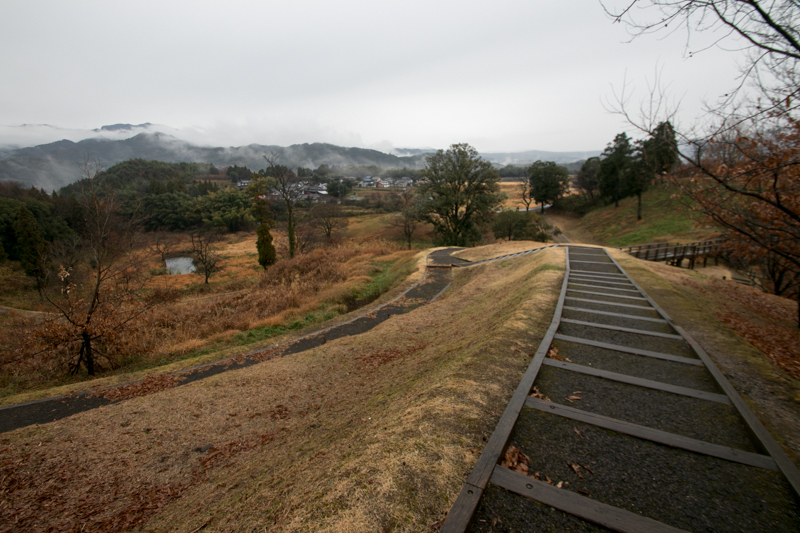 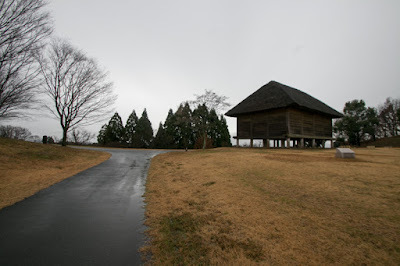 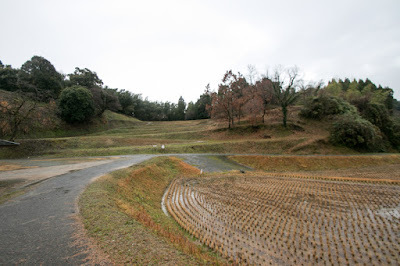 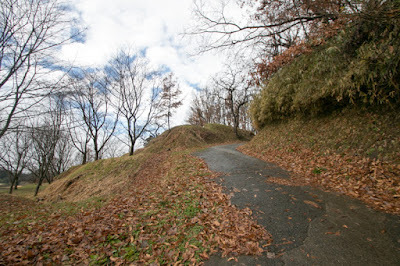 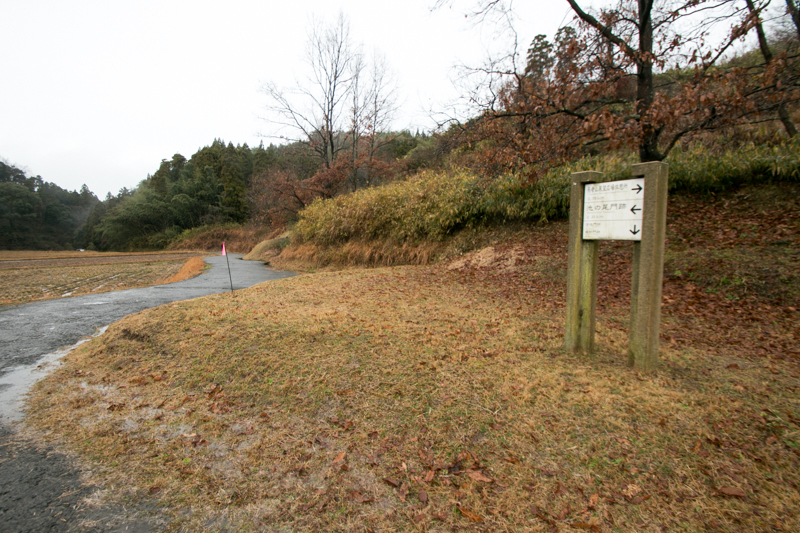 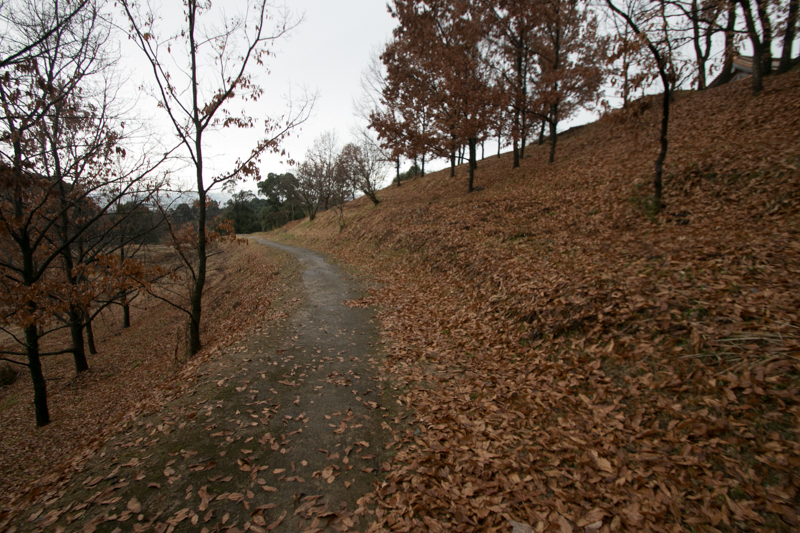 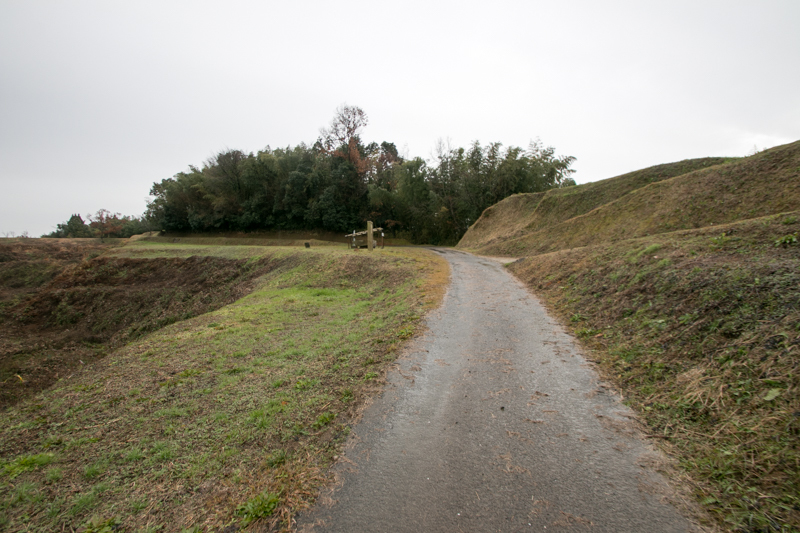 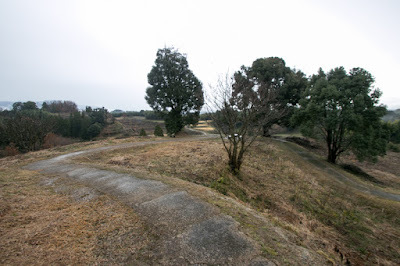 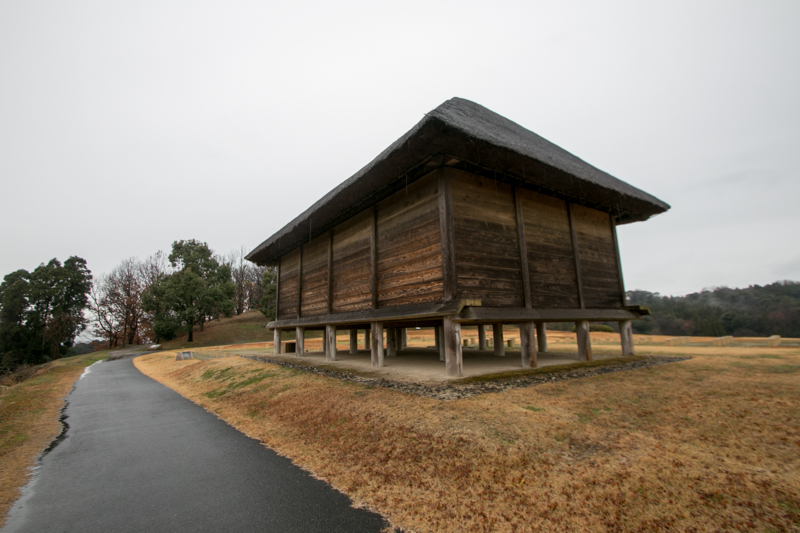 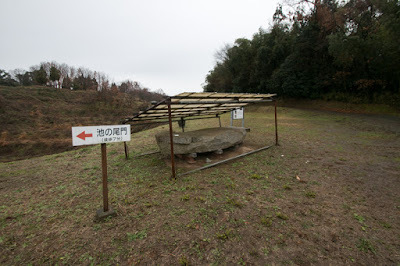 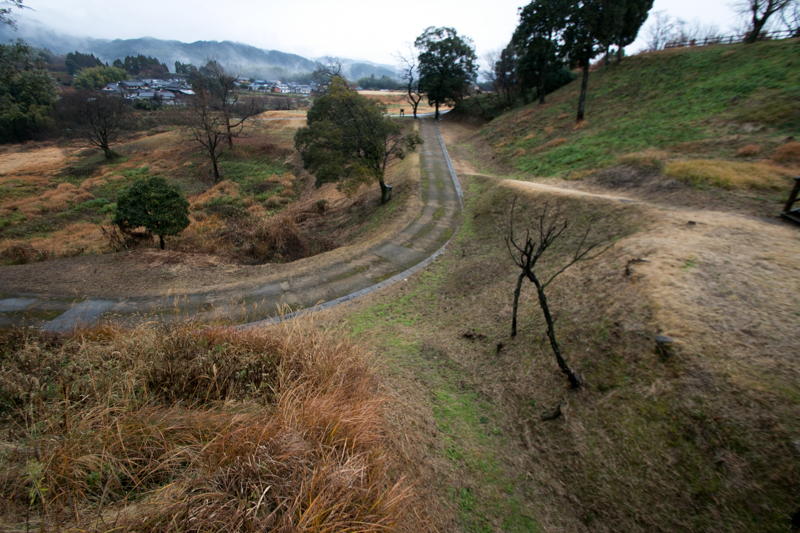 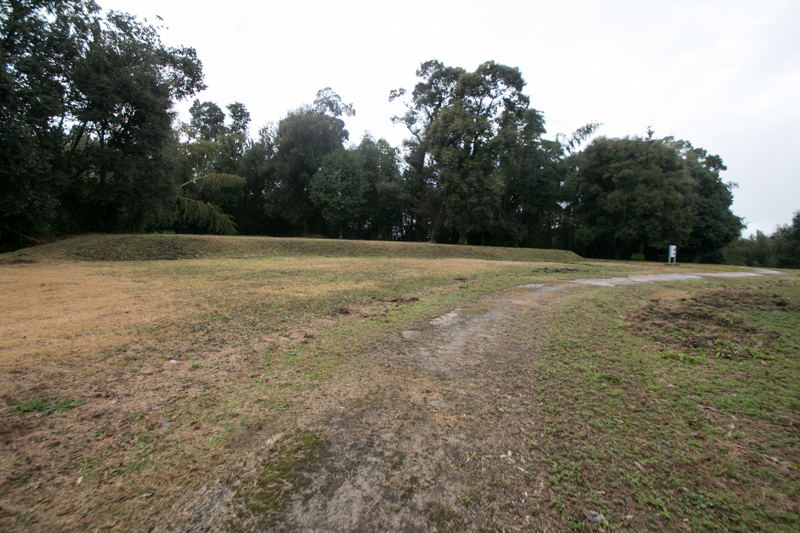 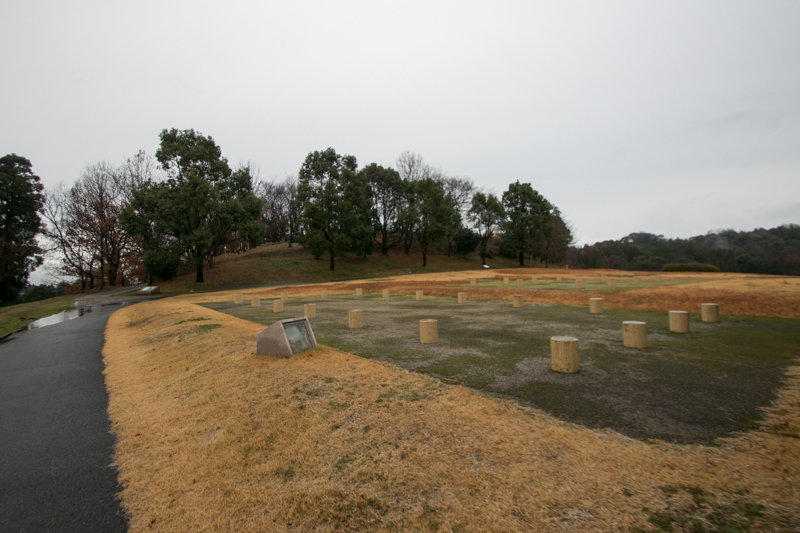 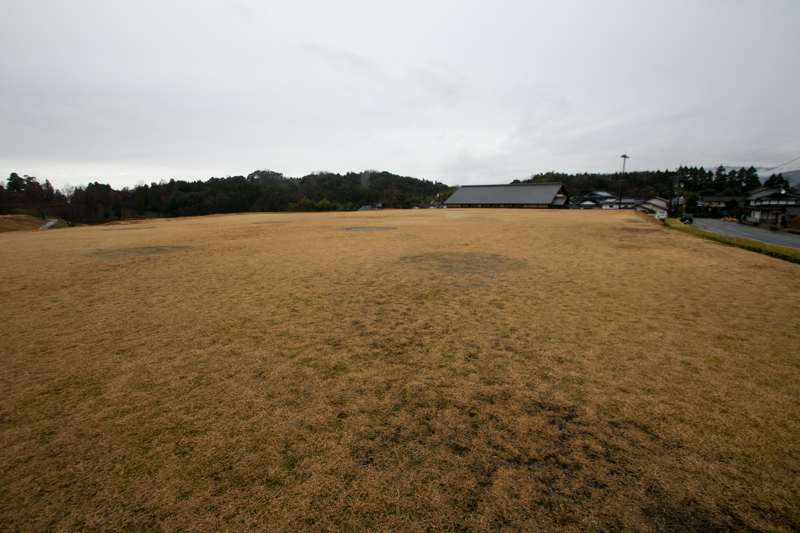 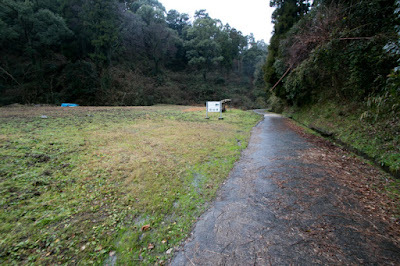 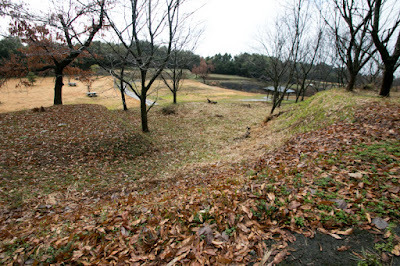 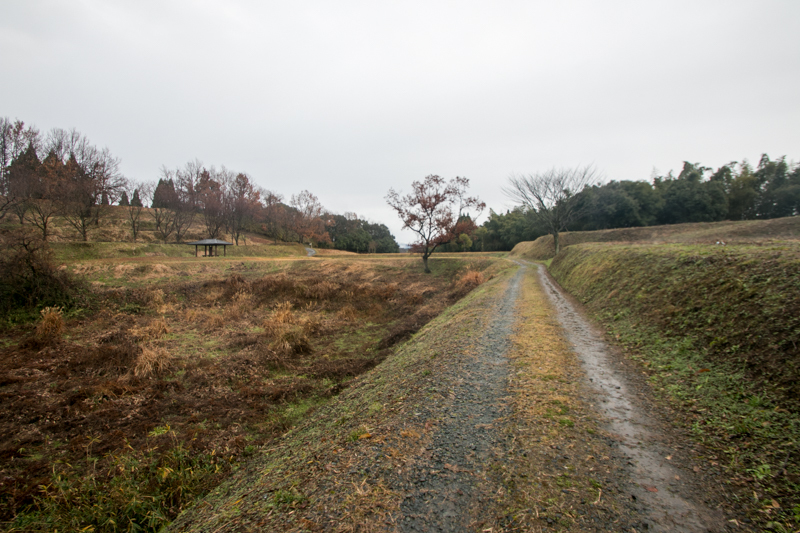 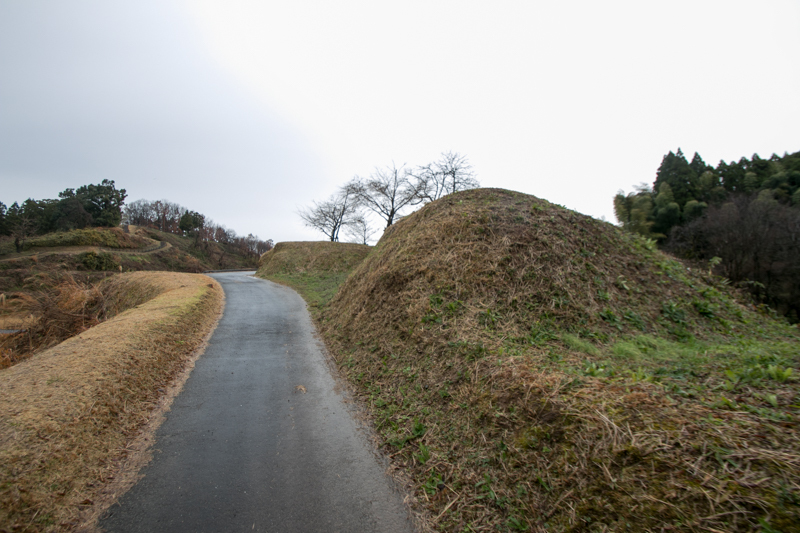 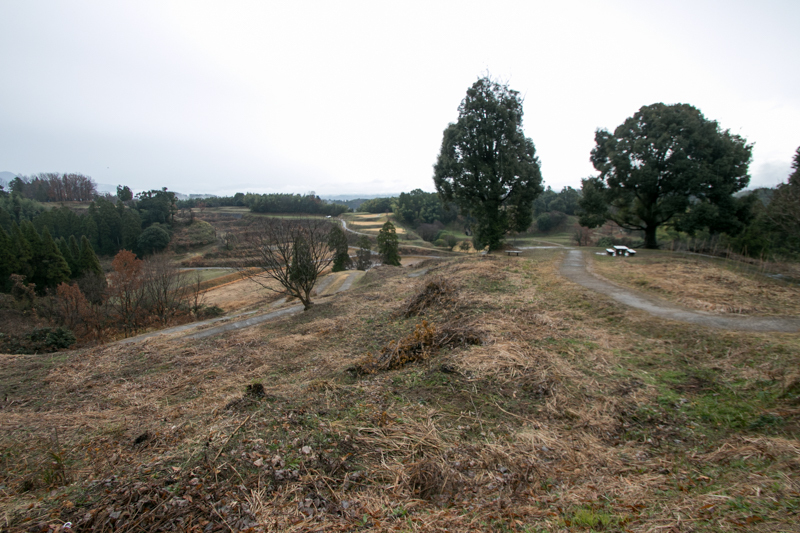 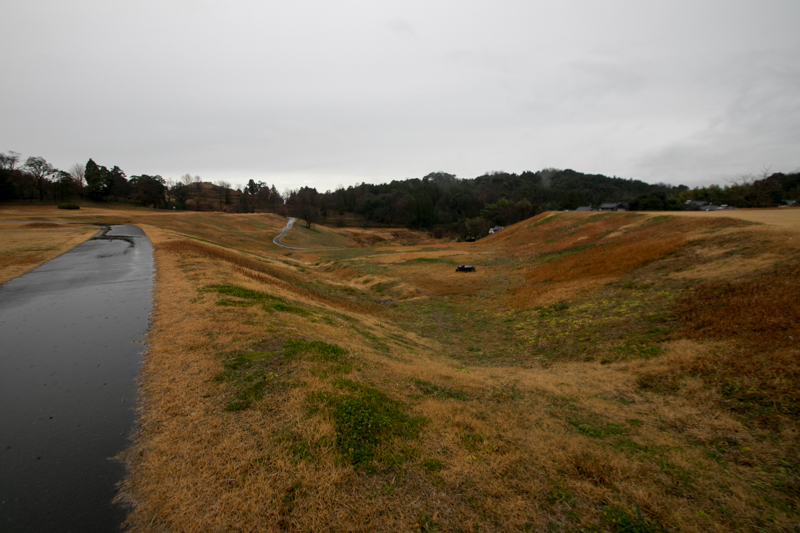 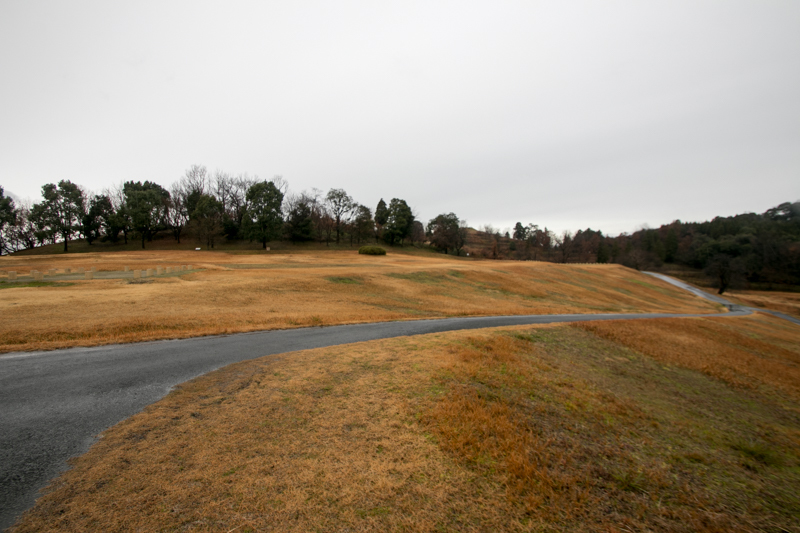 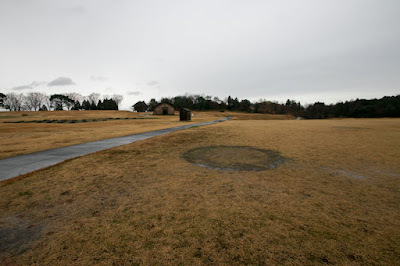 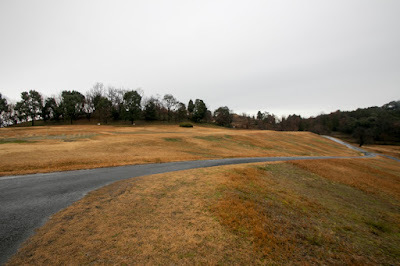 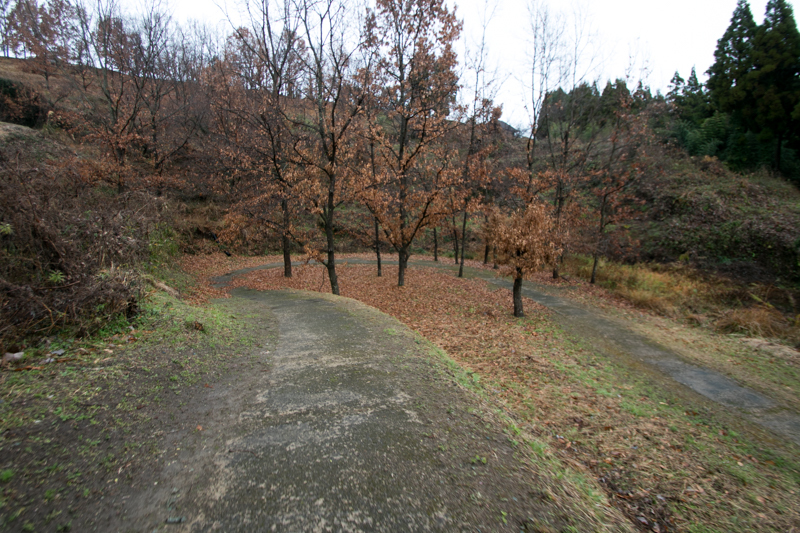 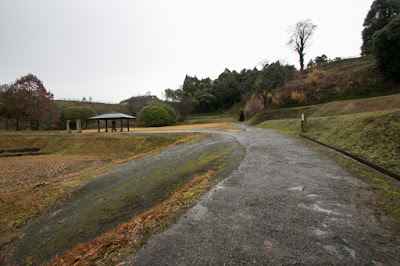 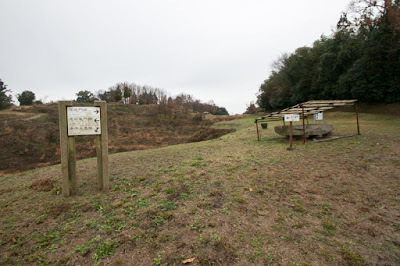 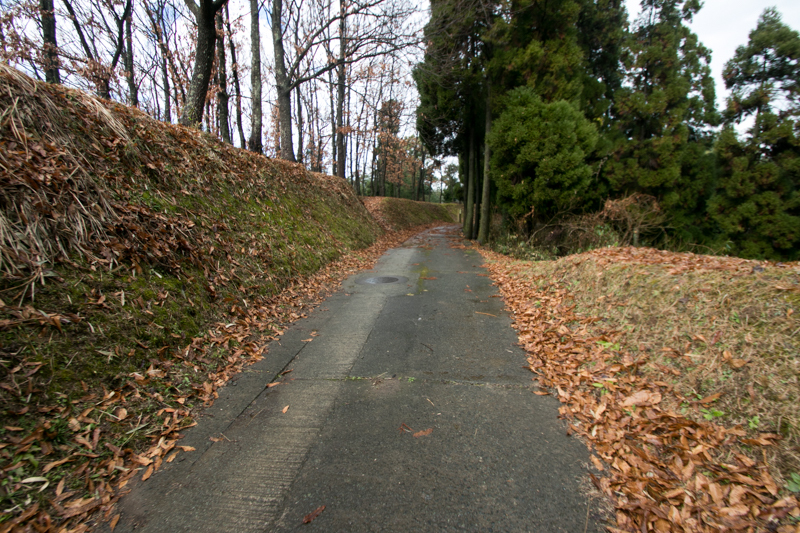 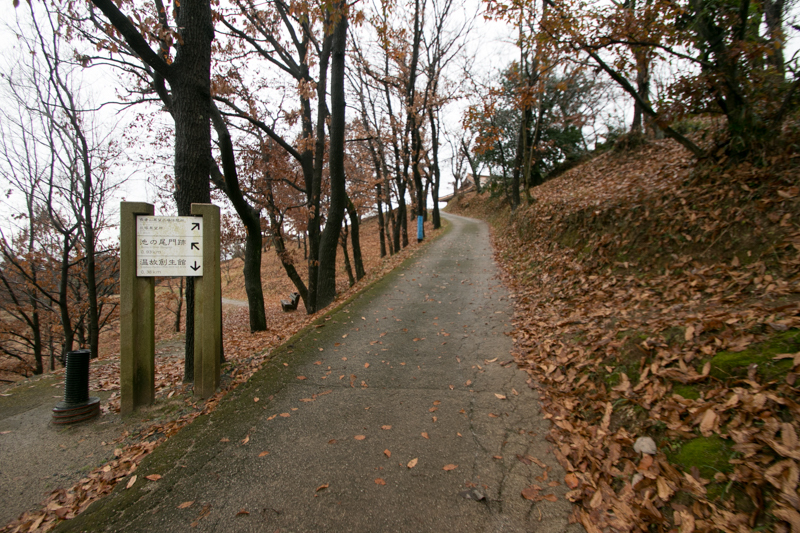 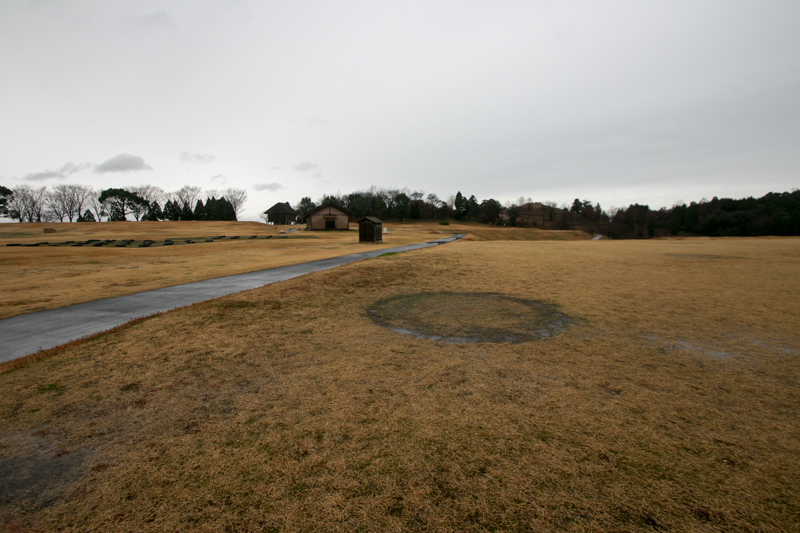 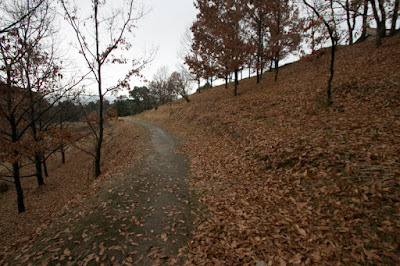 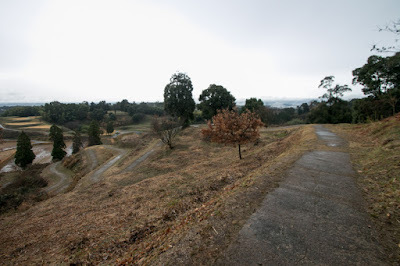 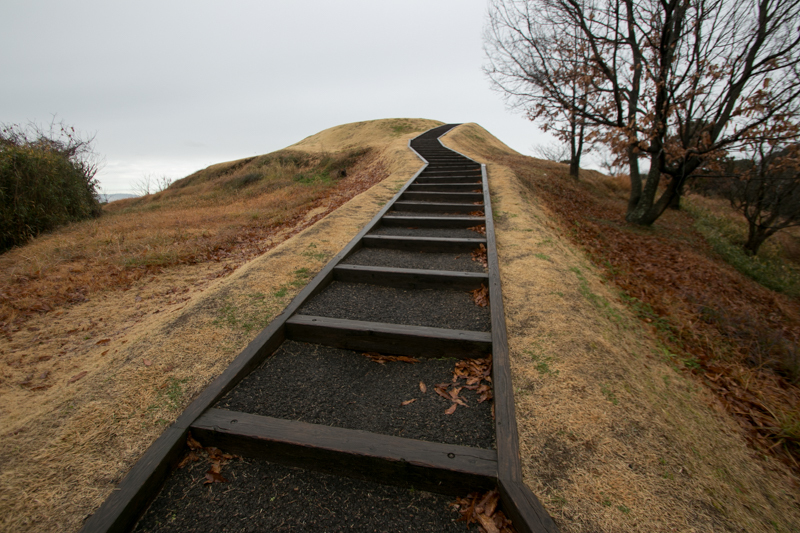 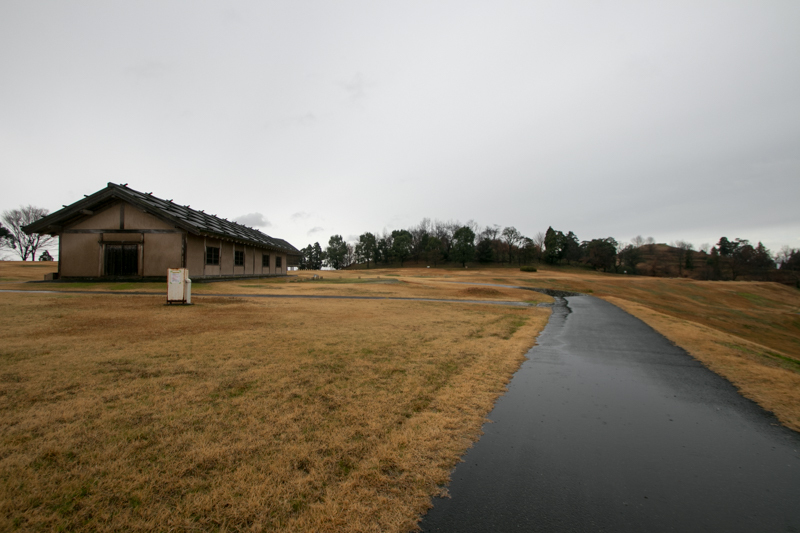 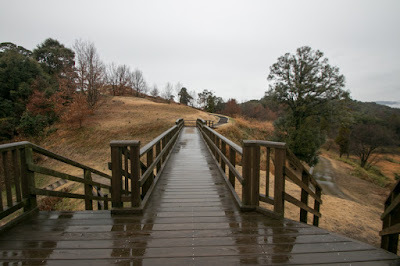 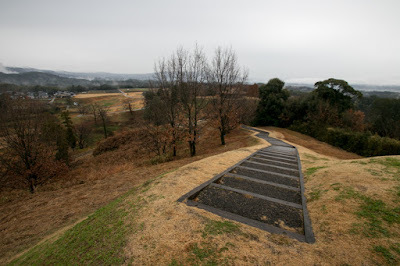 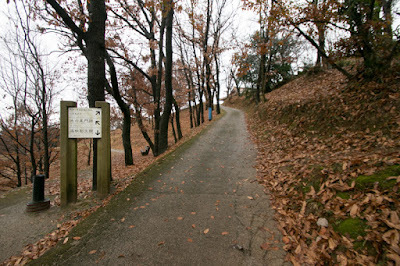 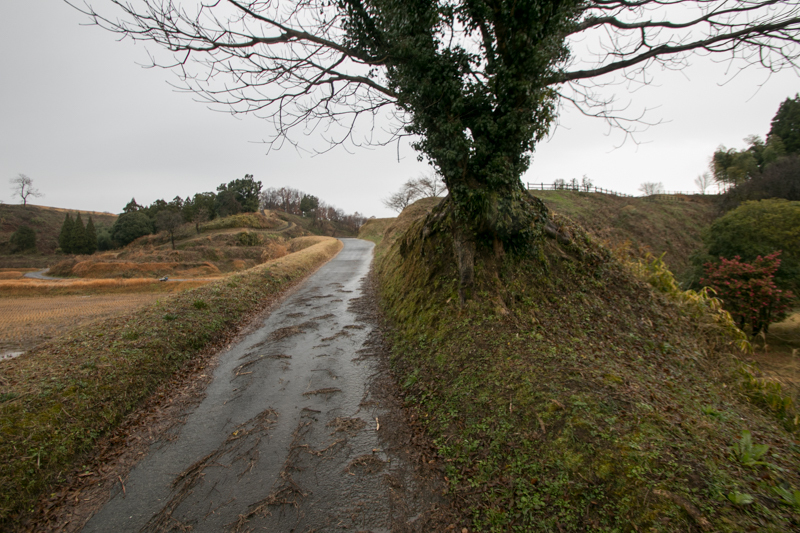 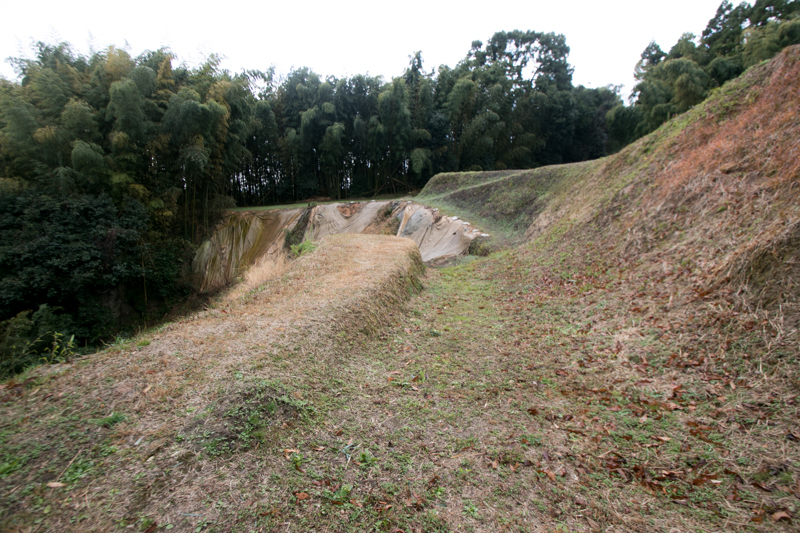 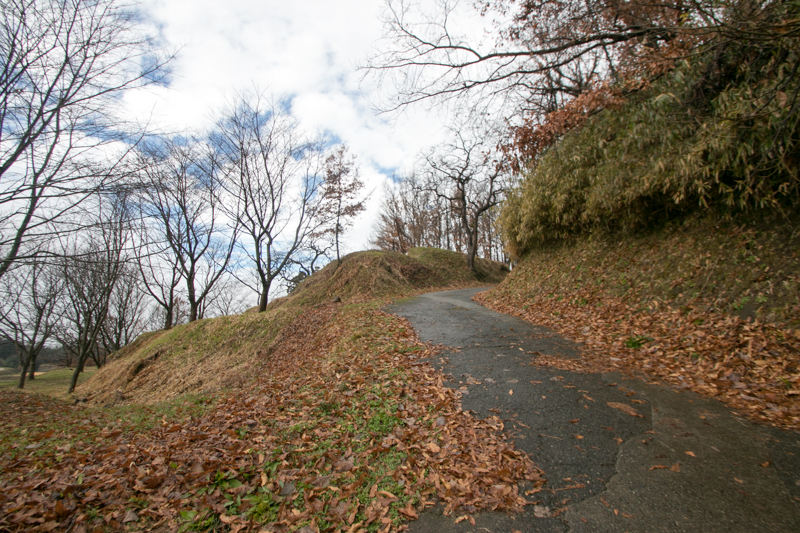 Kikuchi castle was apart from this defense line and might not be thought to use at actual battle. 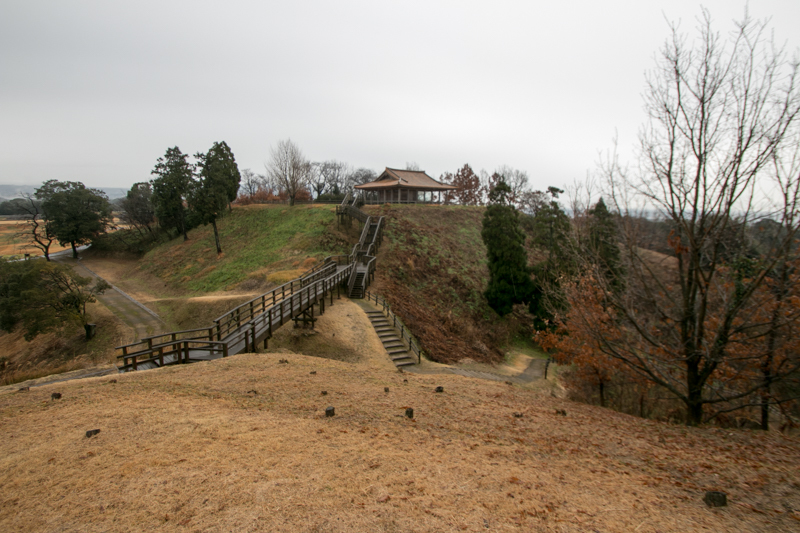 Instead, various missions might be assumed for this castle. 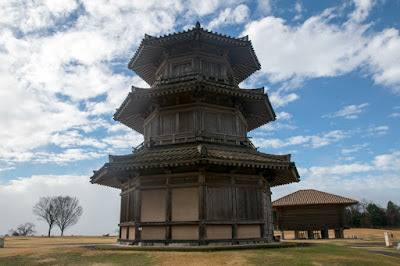 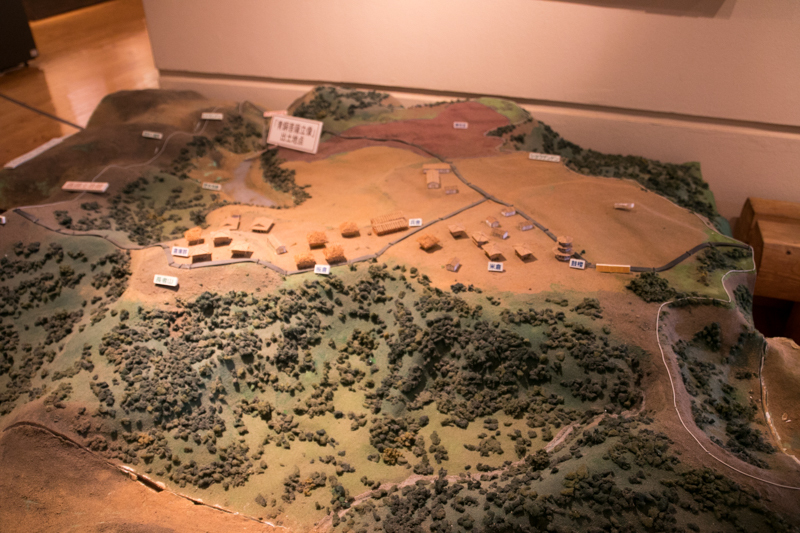 As a main role, it was a supply base of foods and supplies gathered from south half of Kyushu island, to store and deliver to Onojo castle or Kii castle as needed. 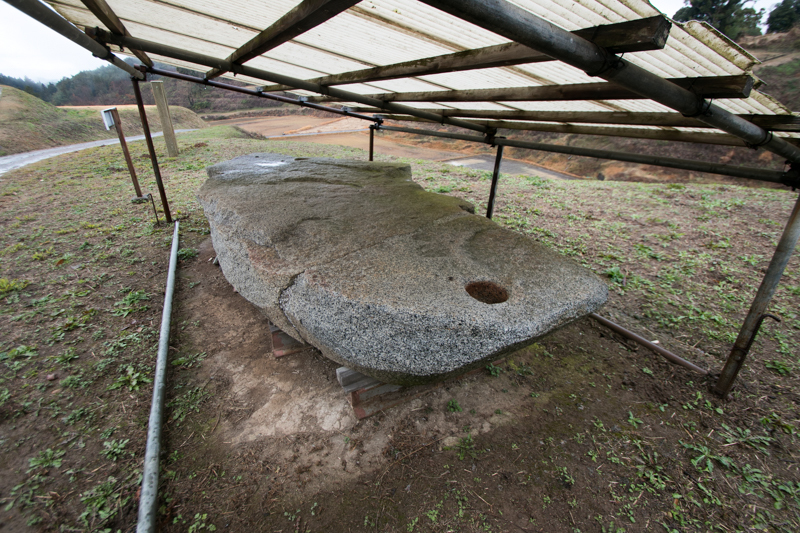 Existence of weapon and food storage was actually recorded at contemporary documents. Besides, it might be a watching place toward south, both for foreign army detoured western coast and land at Tamana area or Kumamoto area, and also south half of Kyushu island followed Yamato dynasty just before. 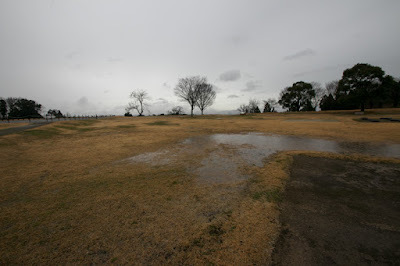 Furthermore, in case of danger of Dazaifu city, Setonaikai sea might be also shut thus Kikuchi castle might be used as an evacuation space. 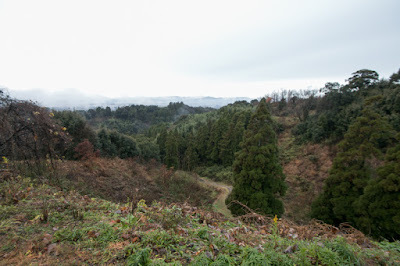 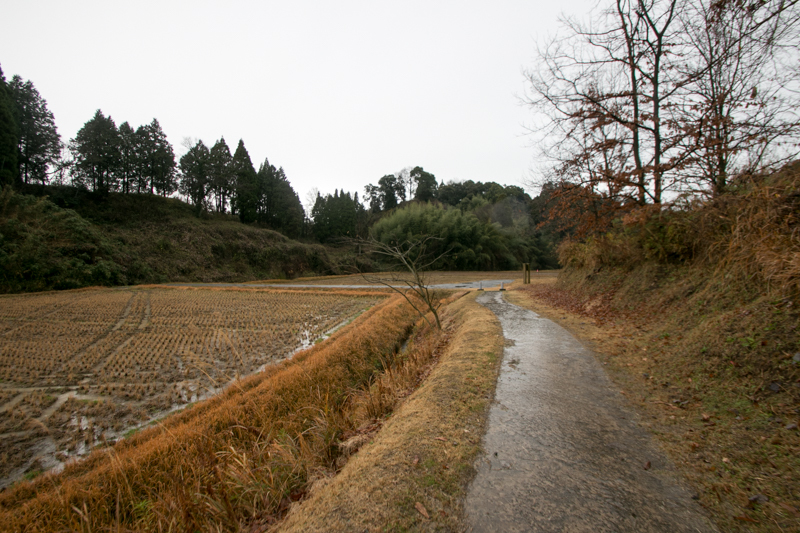 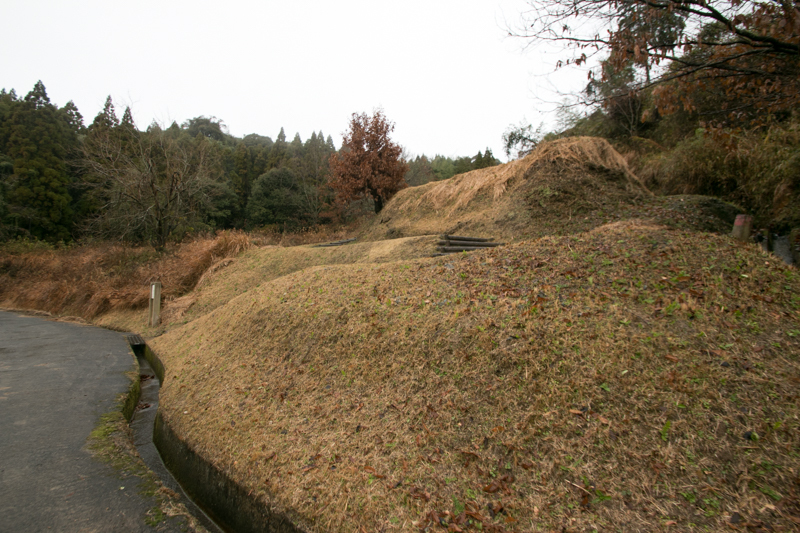 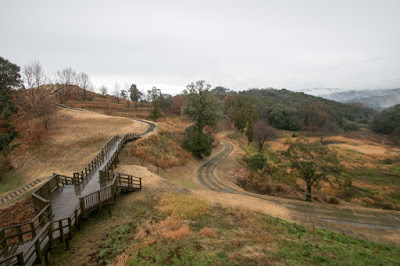 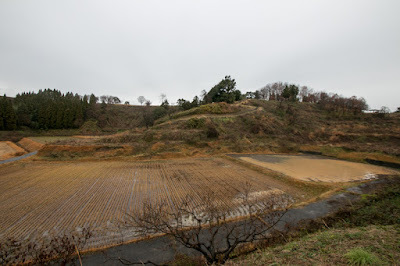 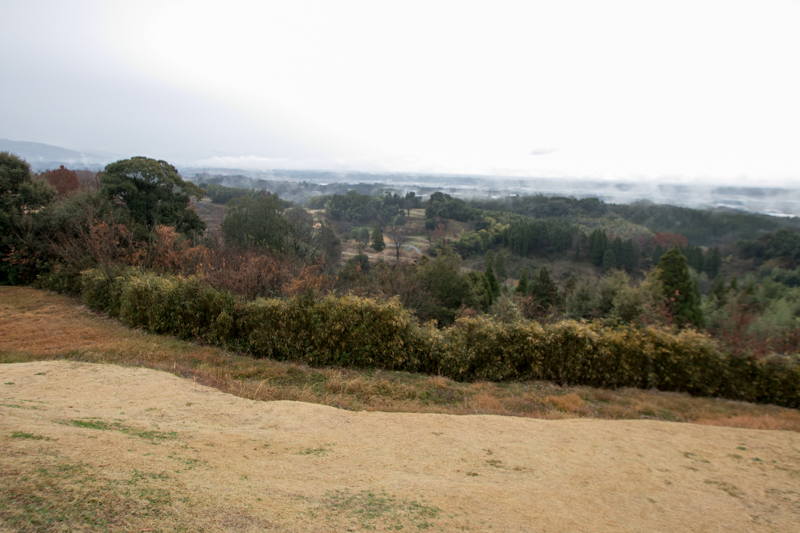 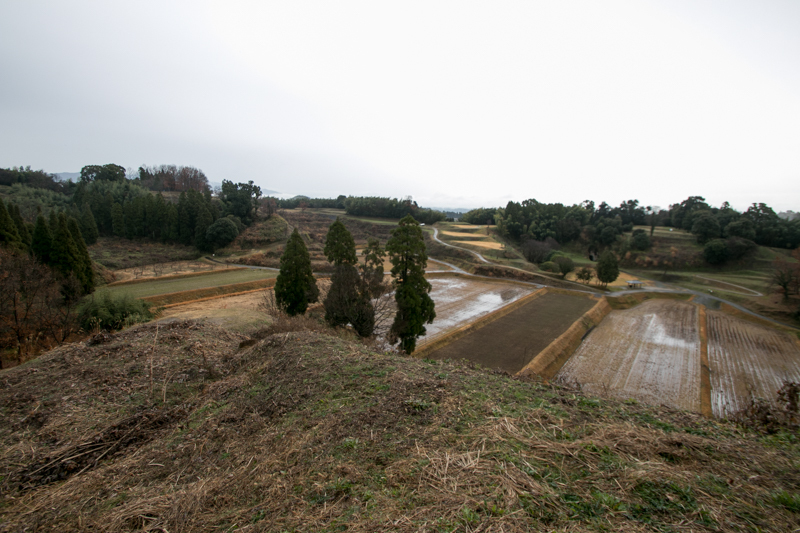 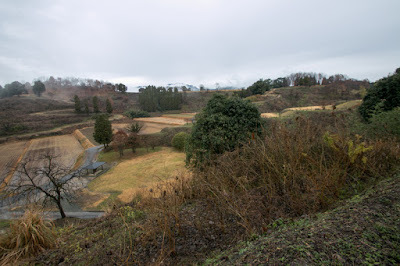 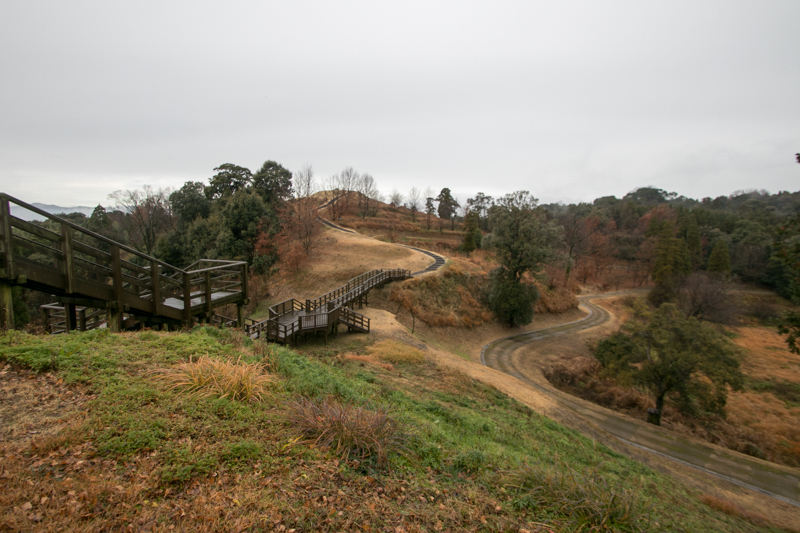 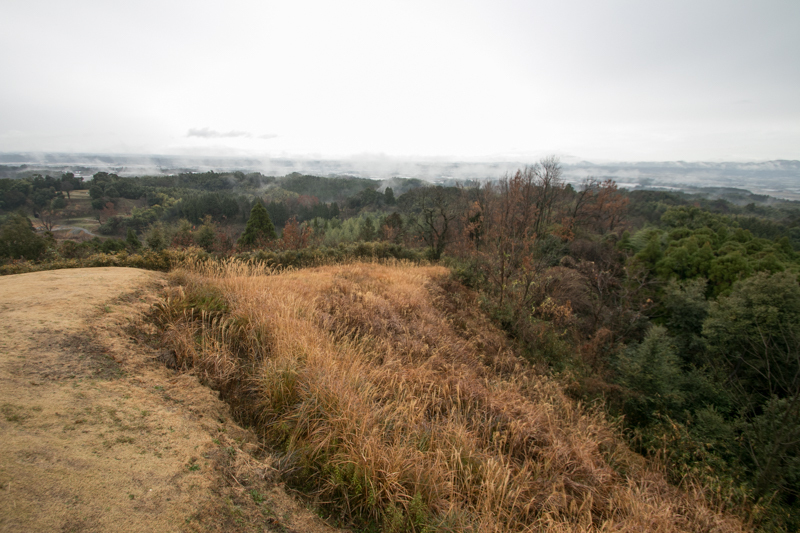 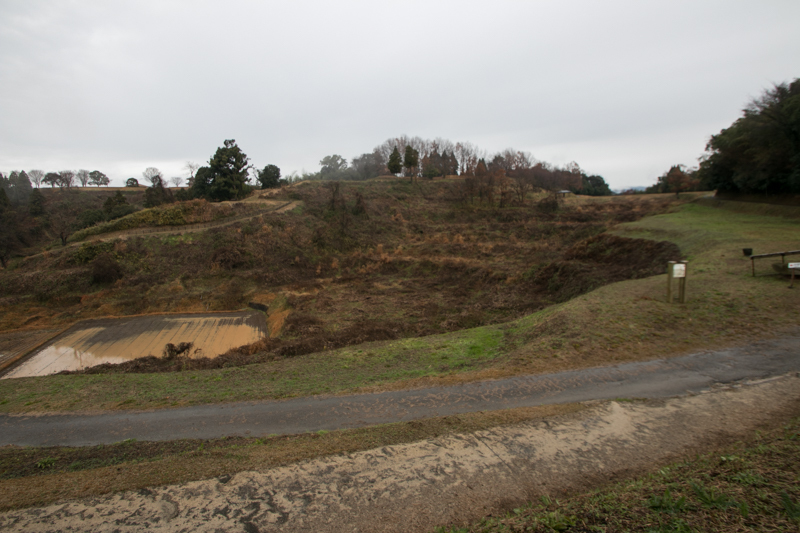 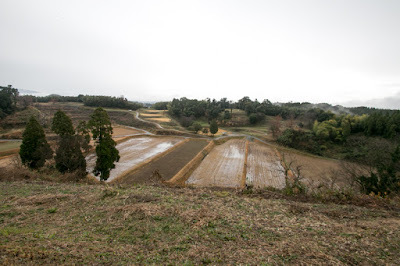 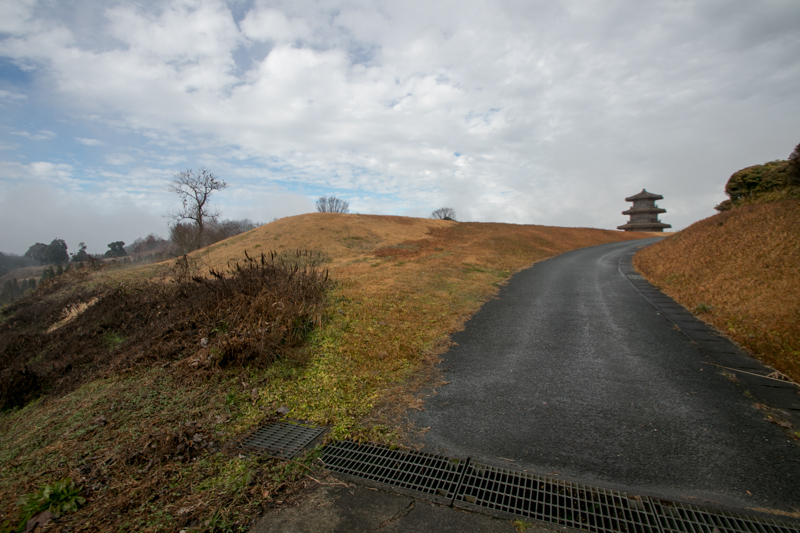 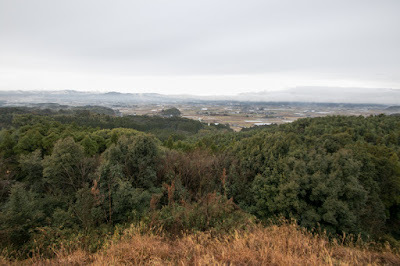 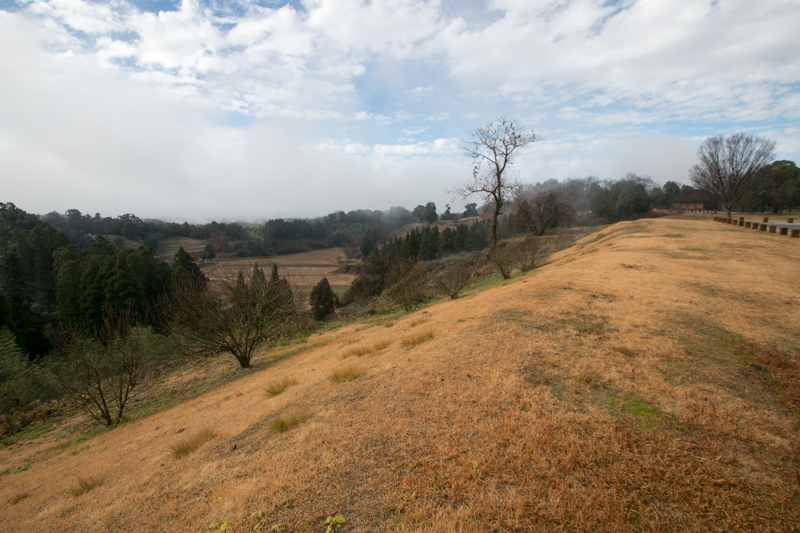 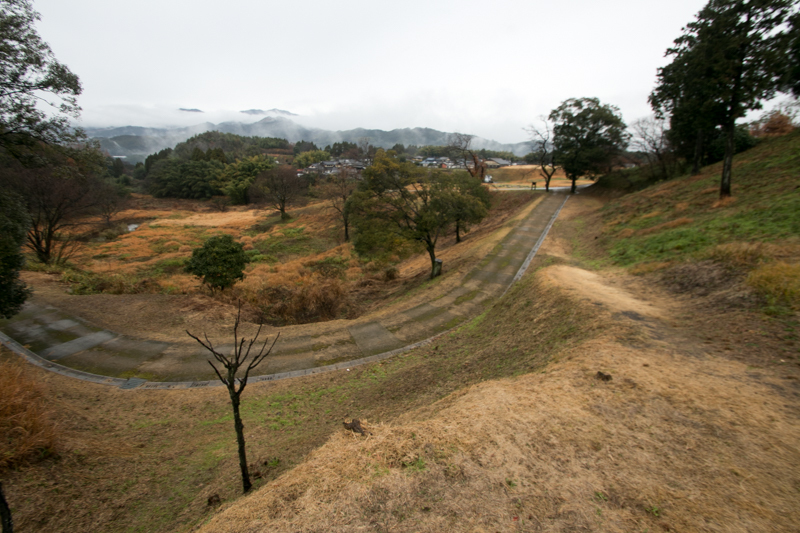 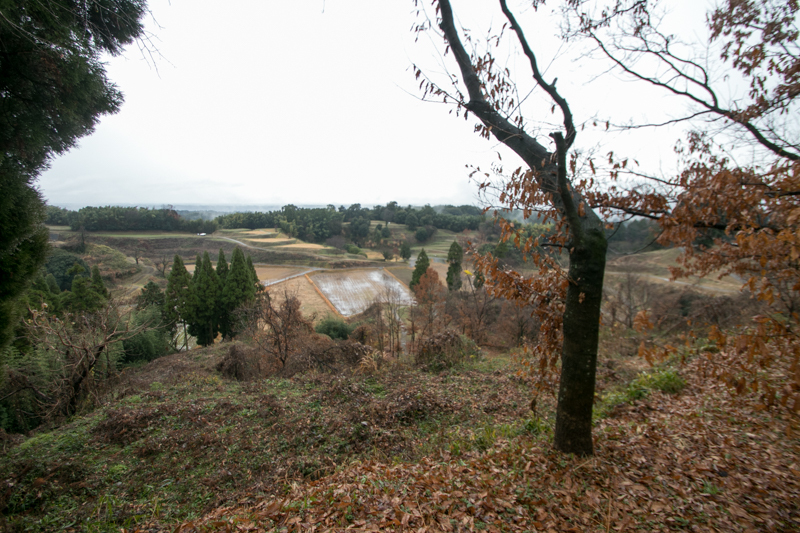 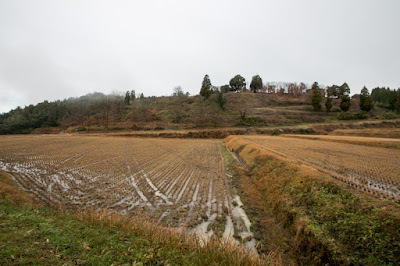 Kikuchi castle consist of plateau part of about 400 meter long and 200 meter wide, and clay walls surround the valley spreads east and westward at the south of plateau area. 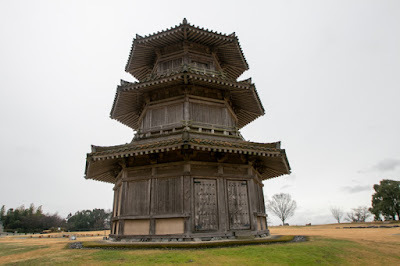 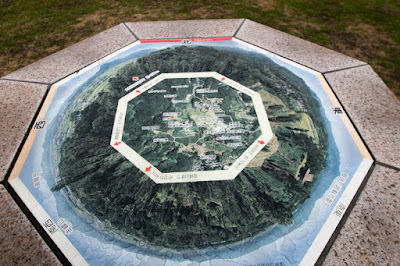 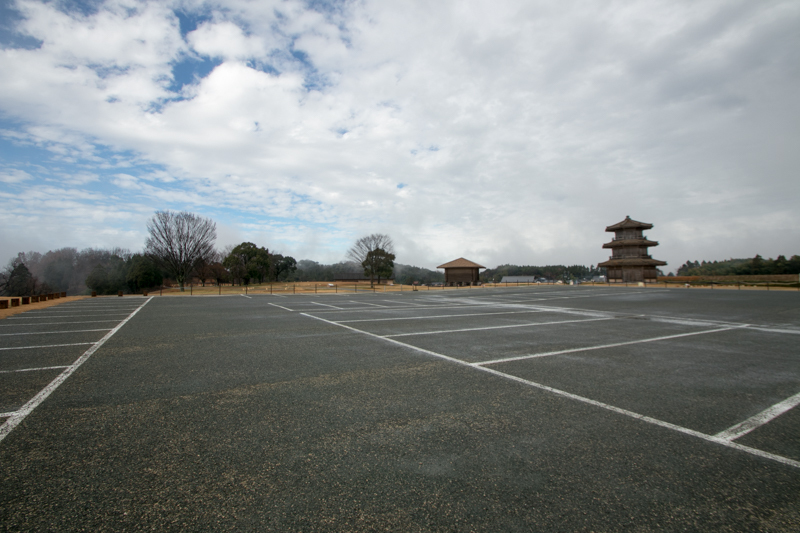 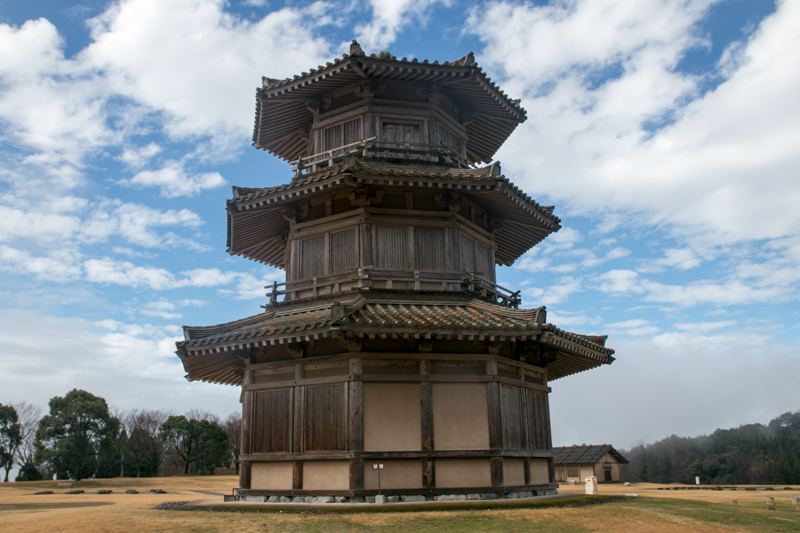 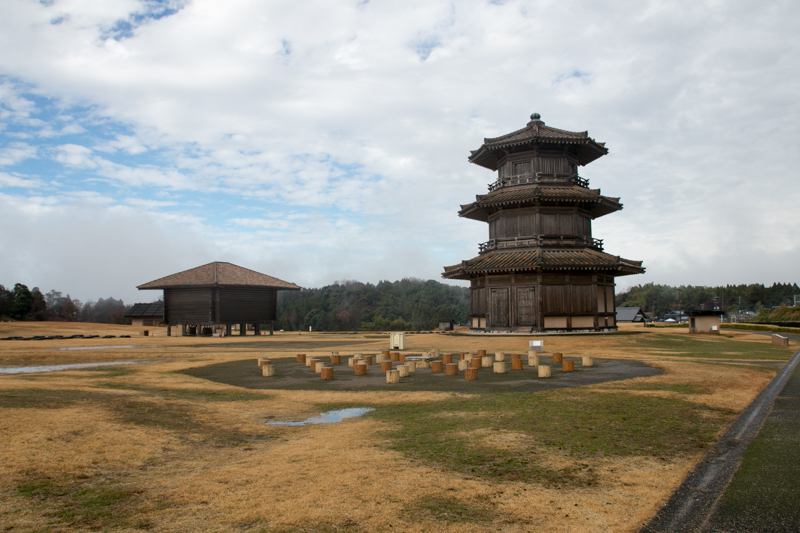 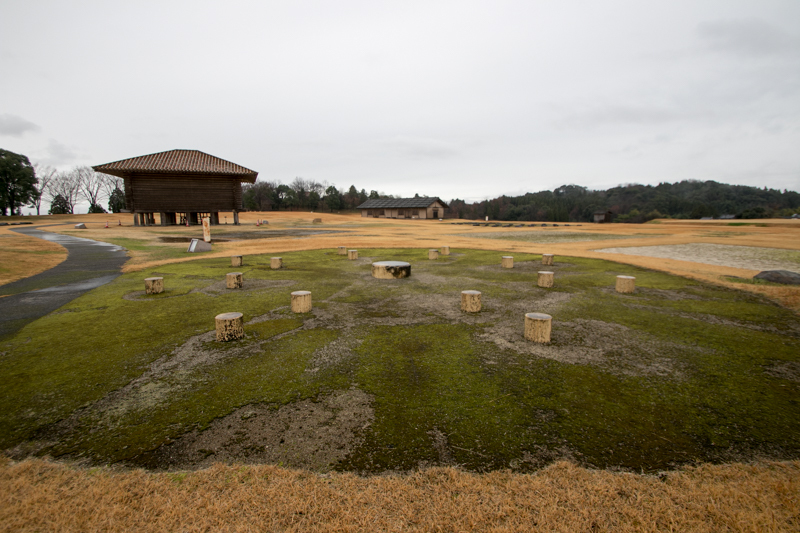 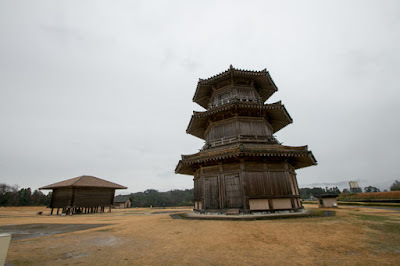 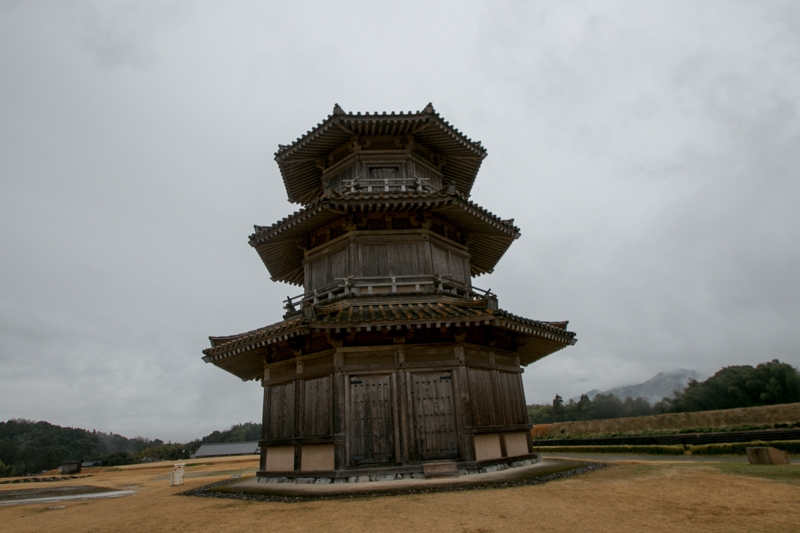 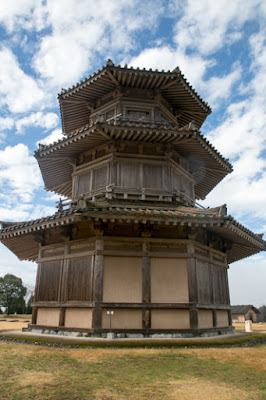 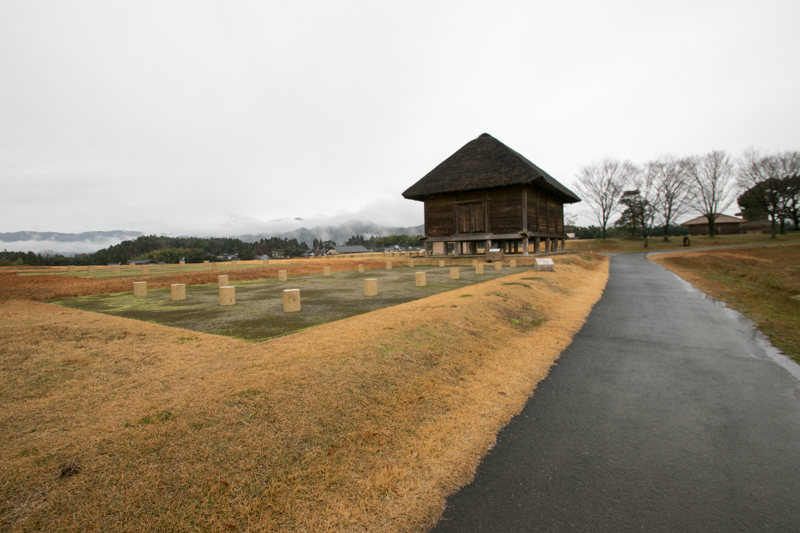 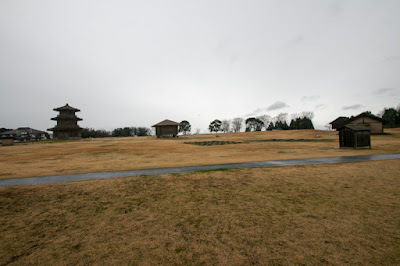 Plateau part was formed into several flat terraces, and many buildings including four octagon shaped wooden tower were built all over the area. This octagon shaped building is not seen other contemporary castle and might be affected Korean style. As a result of excavation, ruins of over 70 buildings built over cornerstones or directly at ground were found. The former might be buildings of rice storage, and the latter might be the houses of soldiers. 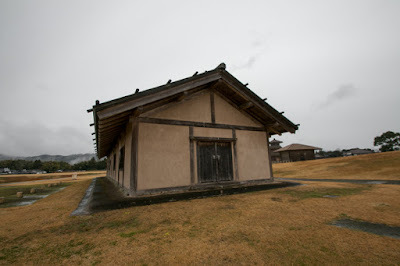 The largest building was 21 meter long and 7 meter wide one, which might be an administrative building of the castle. 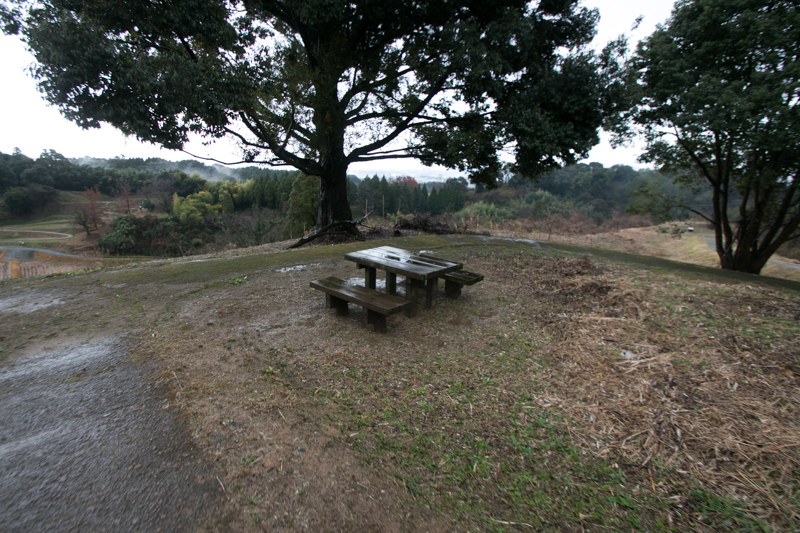 At the west of these dwelling area, there is a small peak might be used as a watching place. 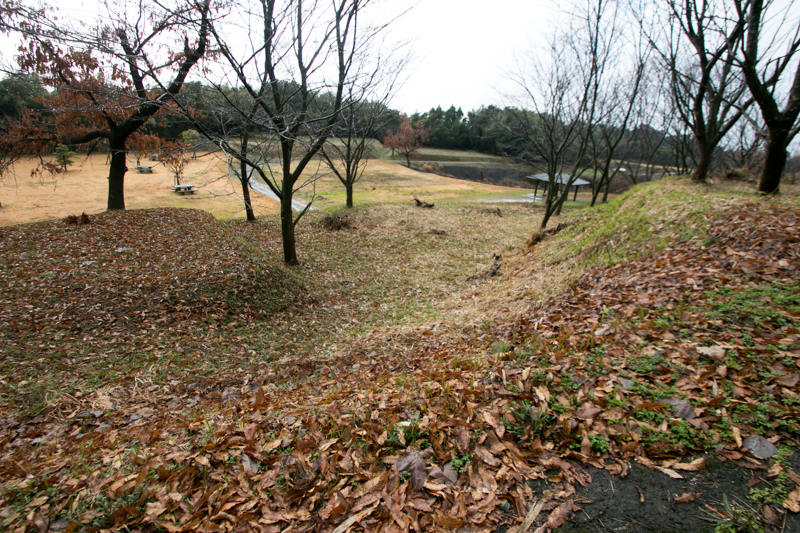 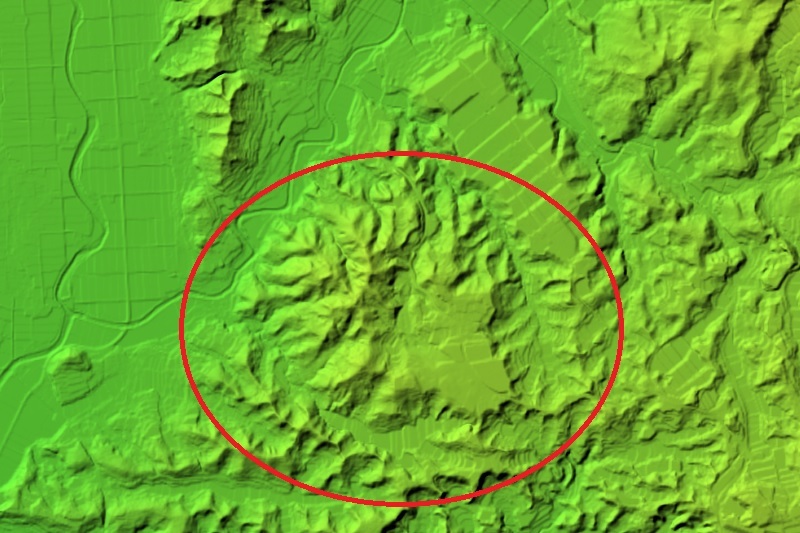 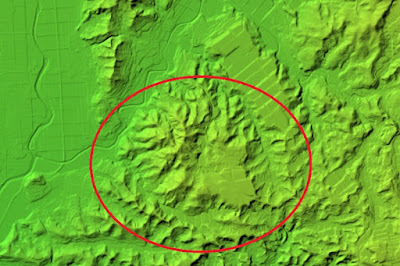 As this plateau part was surrounded by valleys and ridges, outer defense line was built utilizing these valleys and ridges. 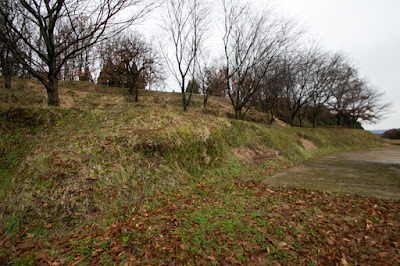 At the western end of southern valley, there was Ikenoo gate which might be protected by stone walls but the ruin was almost lost. 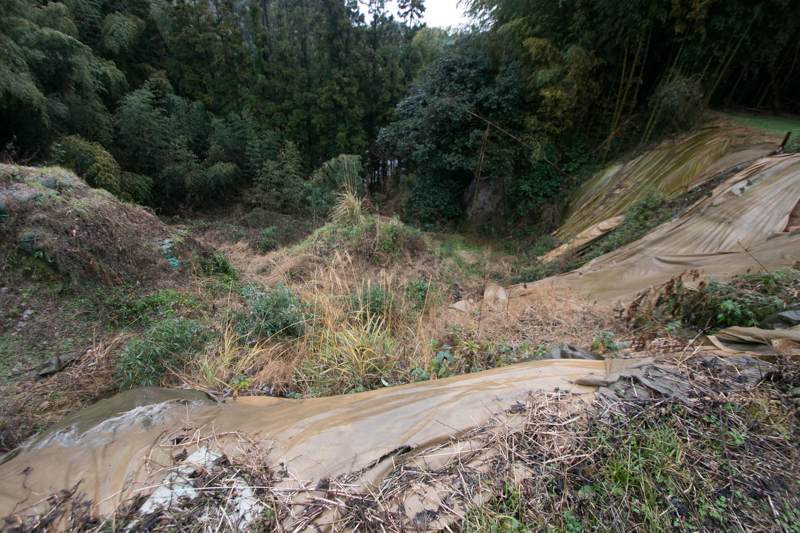 A line of clay wall and terraces continues opposite of this valley, and Horikirimon gate or Fukaoimon gate were built at these clay walls. 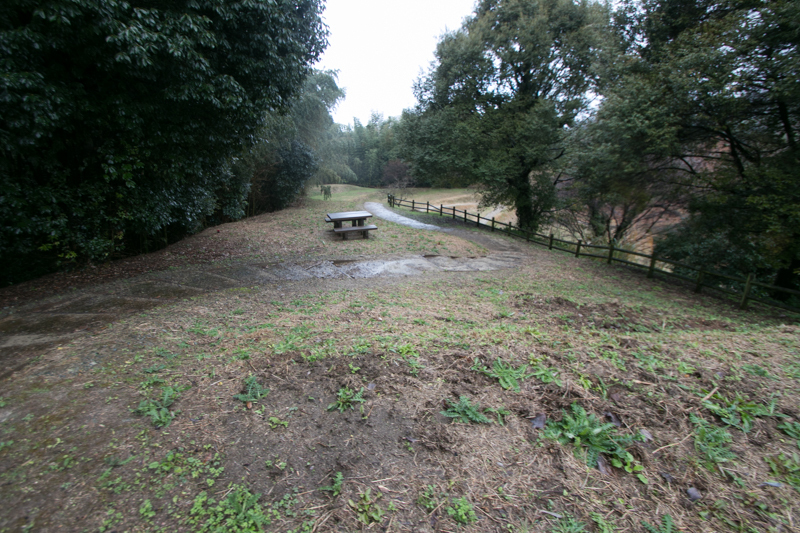 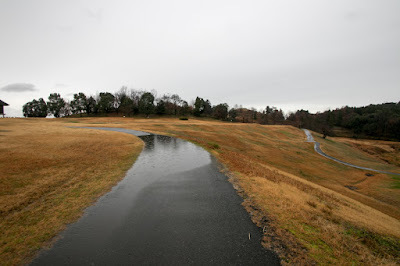 At north side of plateau, there was a ruin of water pond, wood keeping place or signal fire stand. Total size of the castle reached to 800 meter long square. Different from other ancient castles which were heavily guarded by tall stone walls and clay walls, reflecting its conditions, Kikuchi castle has calm atmosphere with various aspects. 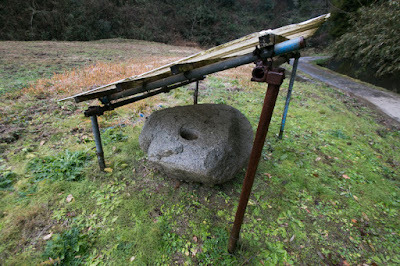 After the stabilization of international relationship, Kikuchi castle might be used by the middle of 10th century, mainly as a storage space of foods for Dazaifu city. 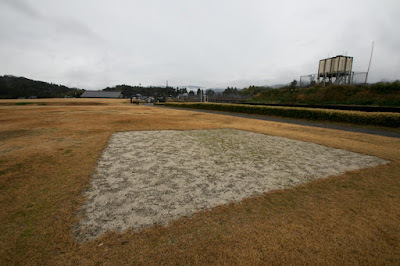 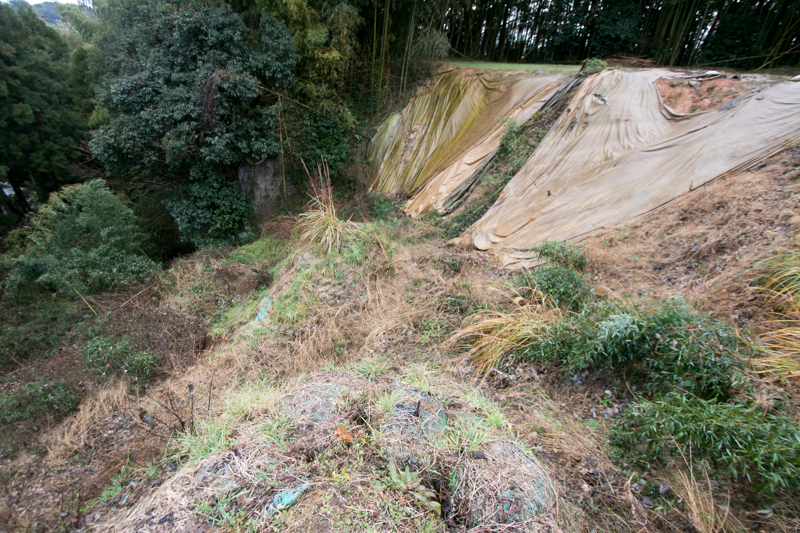 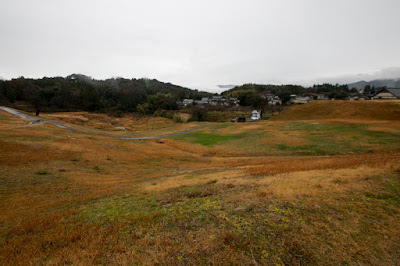 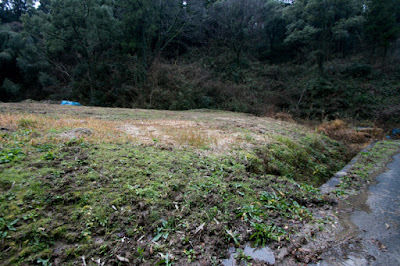 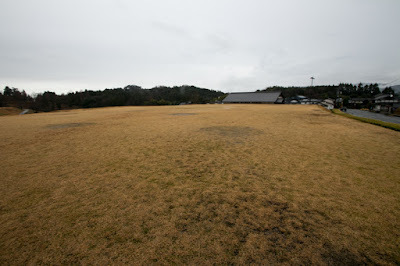 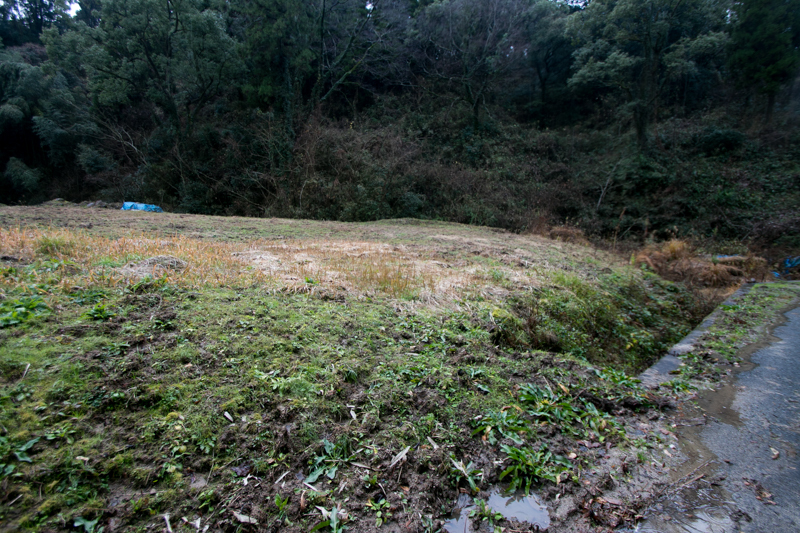 But the name of Kikuchi castle disappeared from the record, and the castle itself also disappeared without clear end. 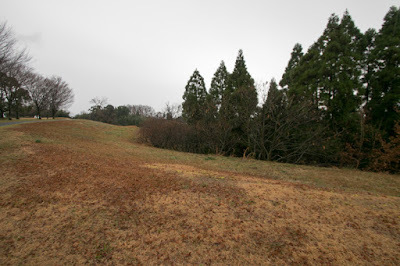 The ruin of castle long lied in the ground except for few stone walls, but as a result of investigation of over 30 years, the shape of magnificent ancient castle was revealed. 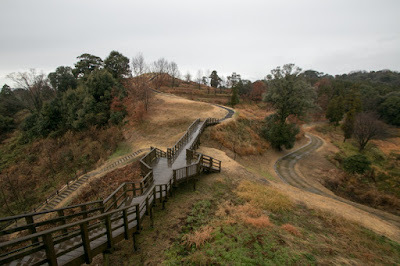 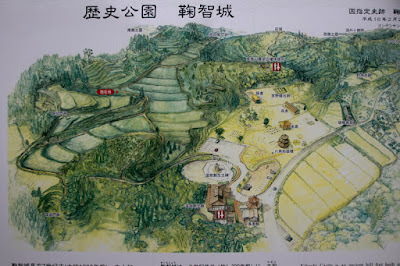 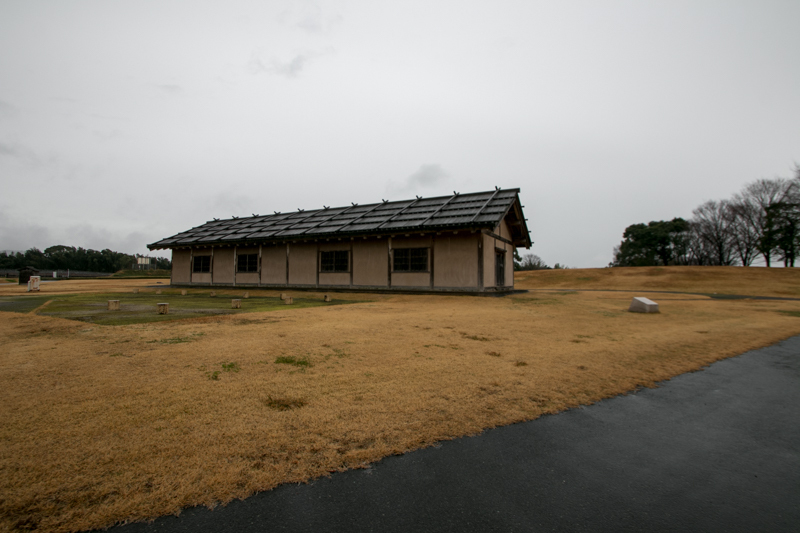 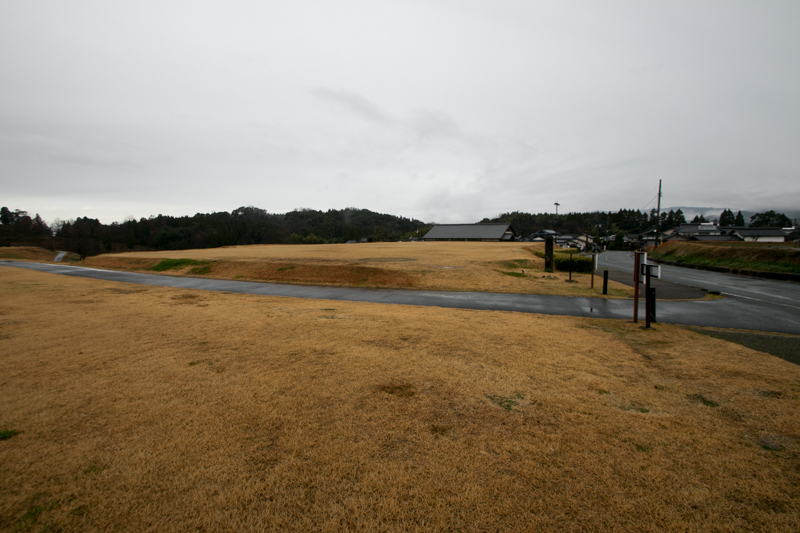 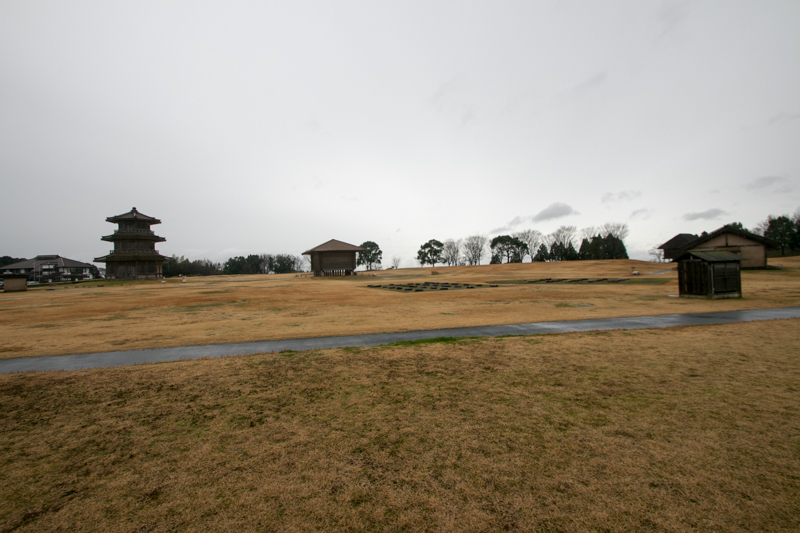 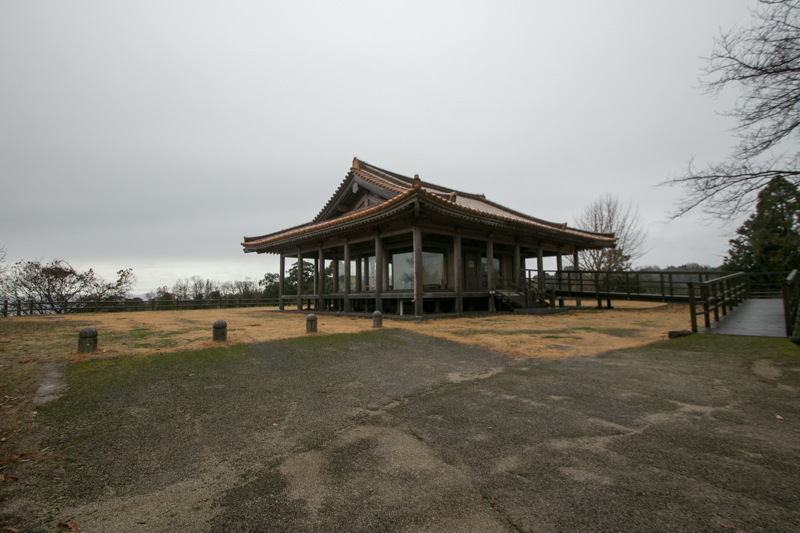 Now castle site become historical park, and the combination of restored buildings and revealed ruins well shows the atmosphere of local base of Yamato dynasty, not seen at other place.